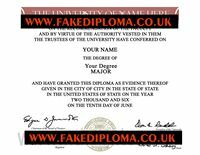 Please keep in mind that all of these Fake Diplomas and Fake Transcripts are just samples. 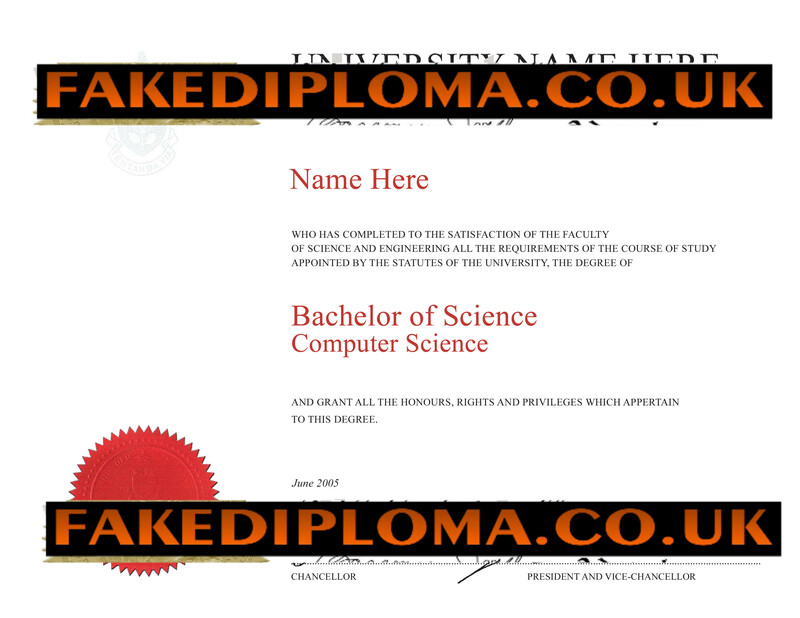 Each order is custom designed to meet our customers needs. 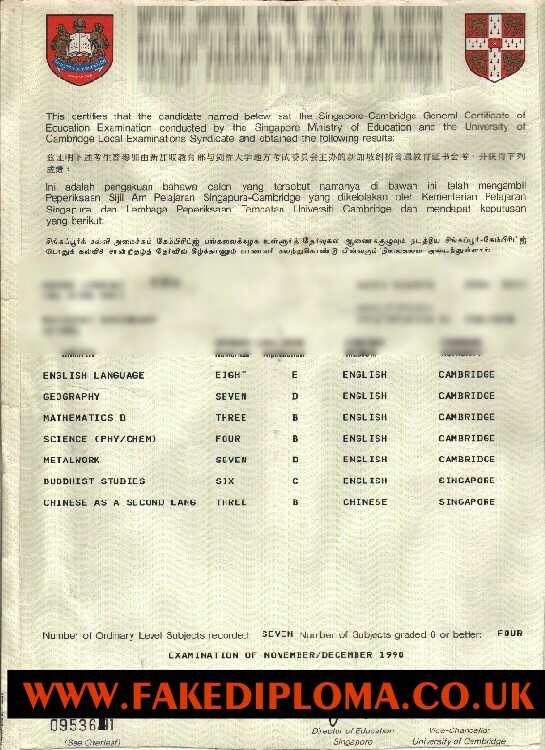 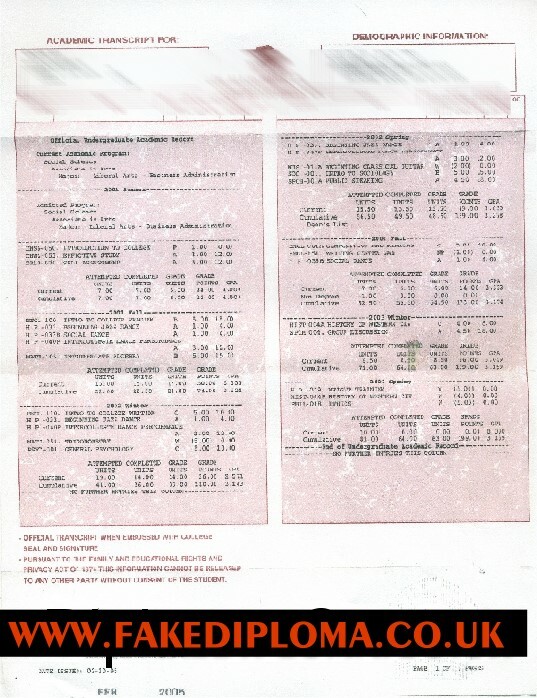 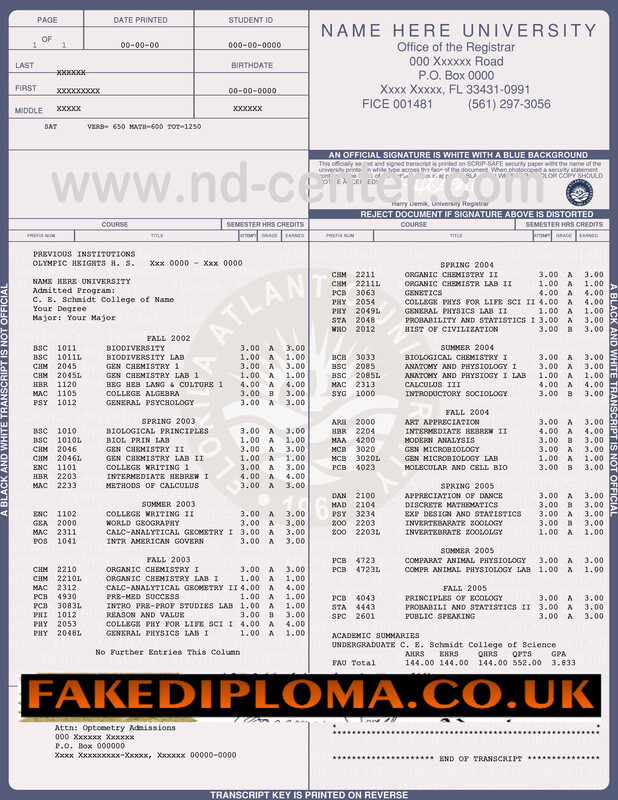 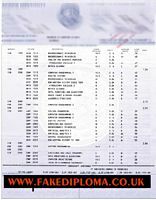 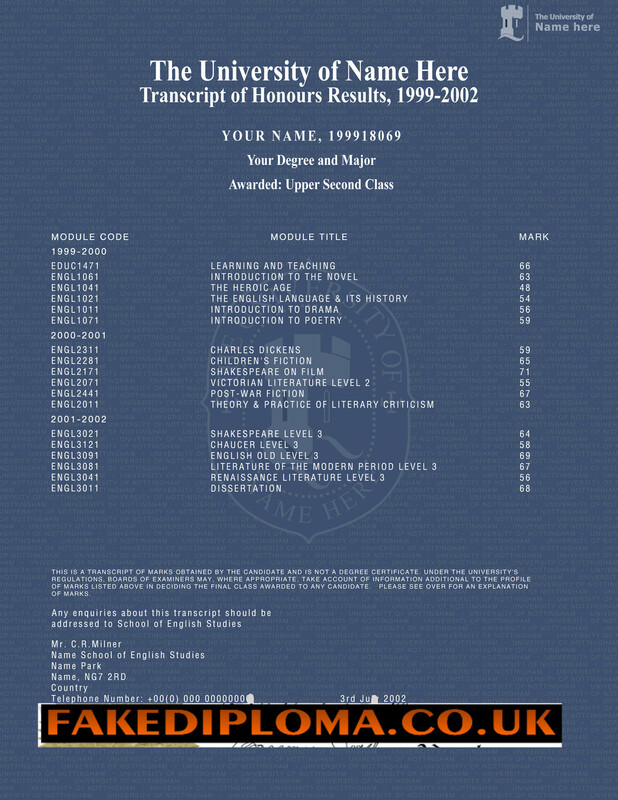 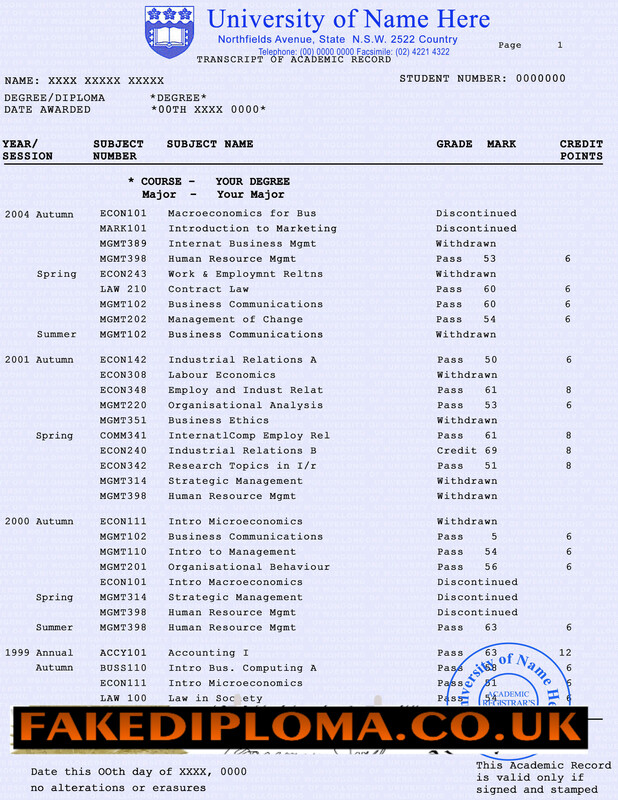 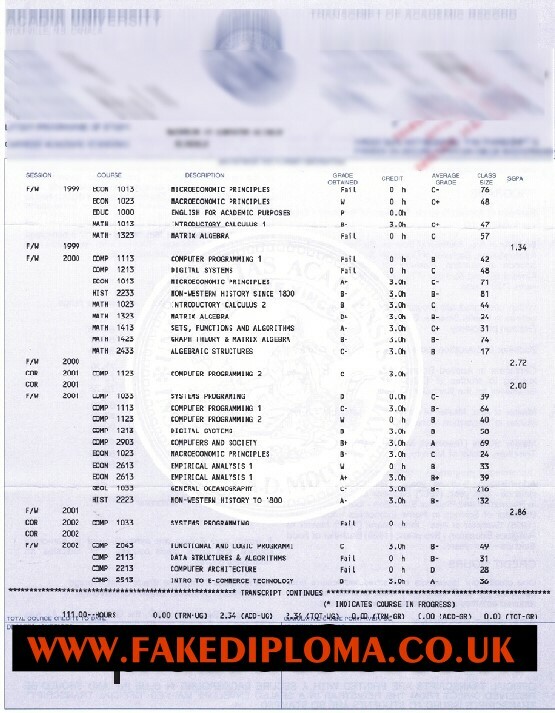 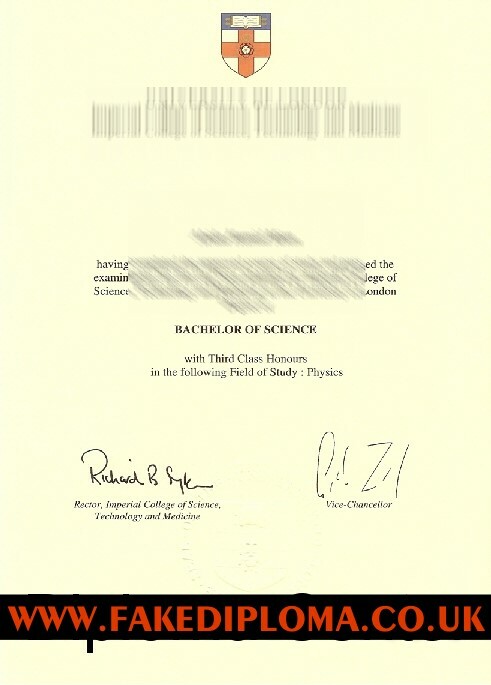 Any fake diploma or fake transcript you require and samples in this page are distorted and the custom designed novelty diploma, degree or transcript will be clearly visibly, simply click on the thumbnail on any image to view a higher resolution representation of the given image and also remember that this is only a fraction of the sample images that we have designed. 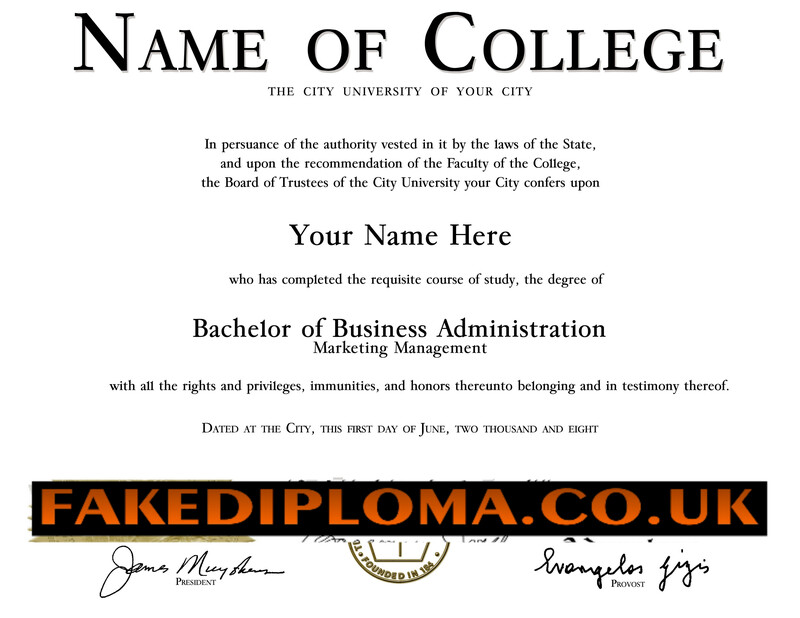 Designs are available for every college, school and university worldwide. 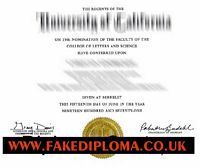 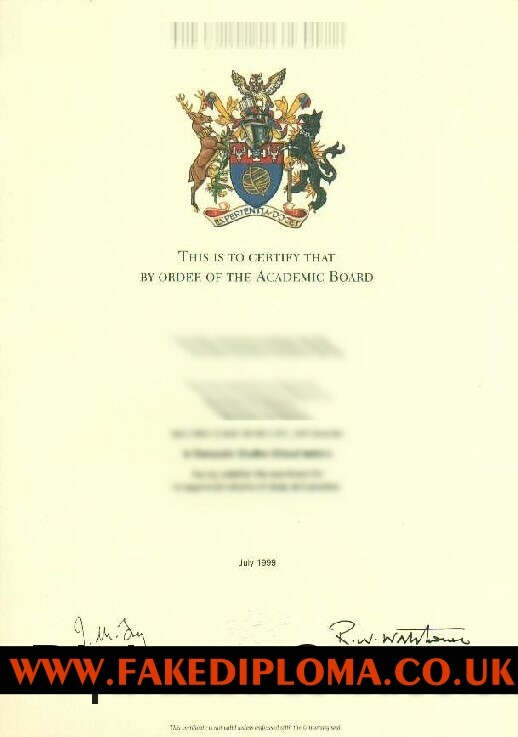 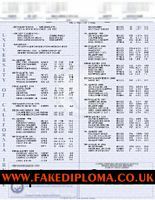 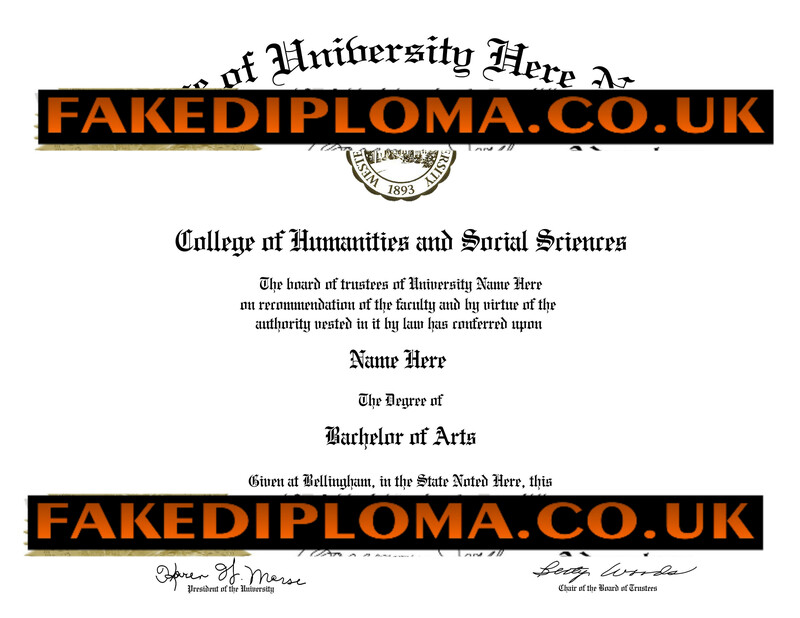 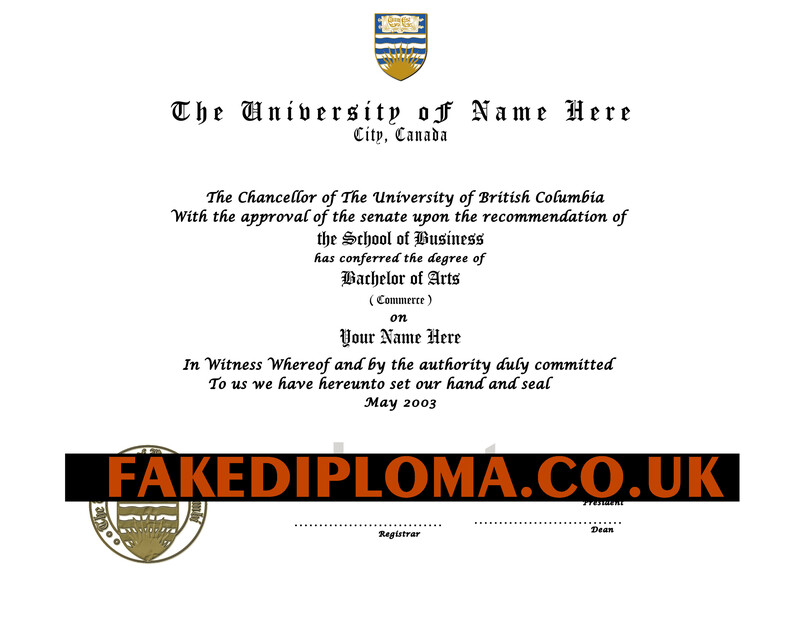 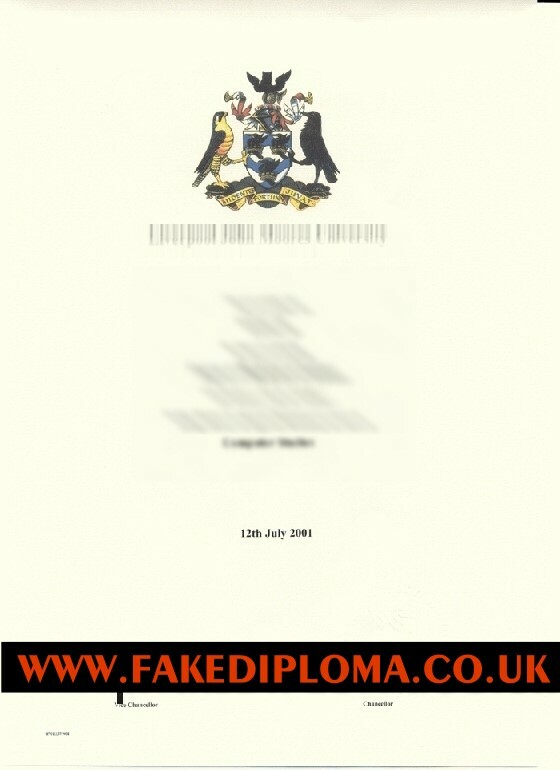 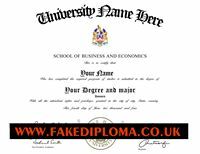 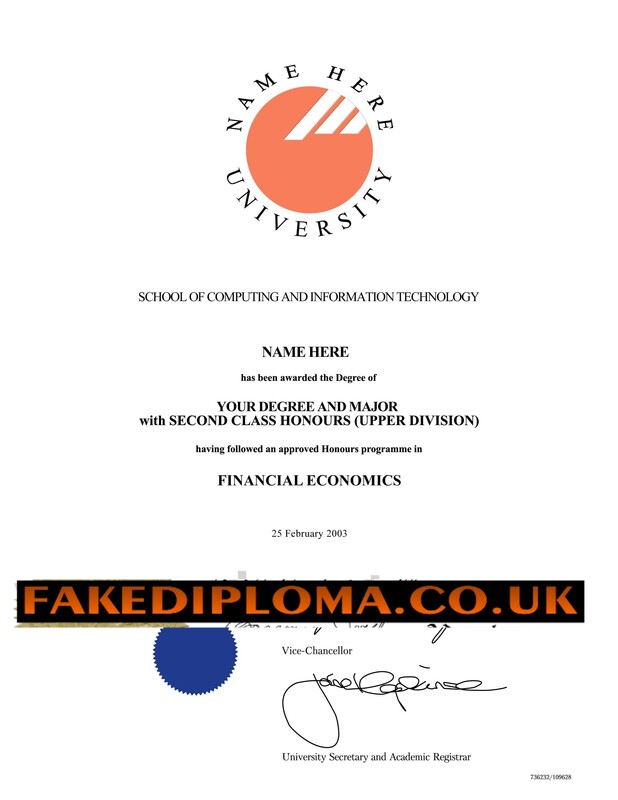 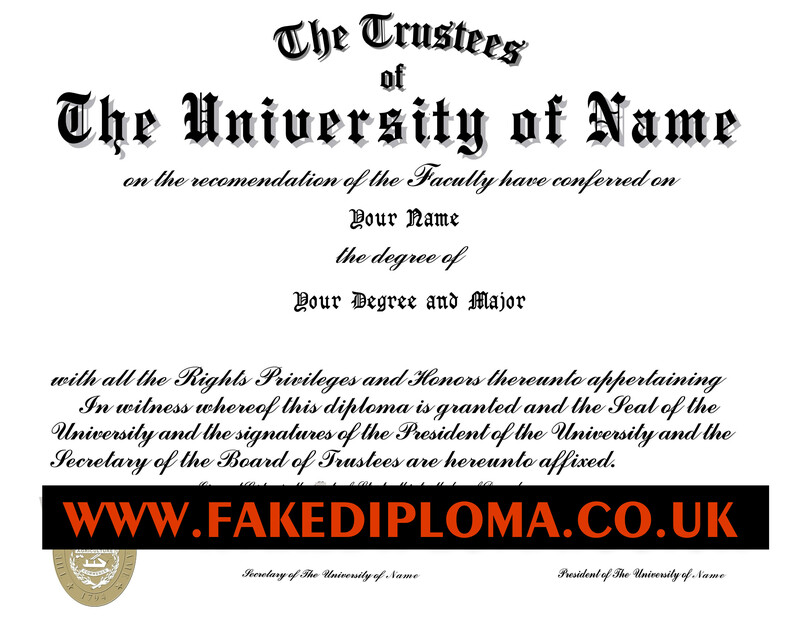 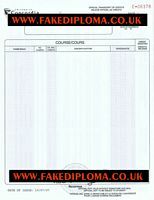 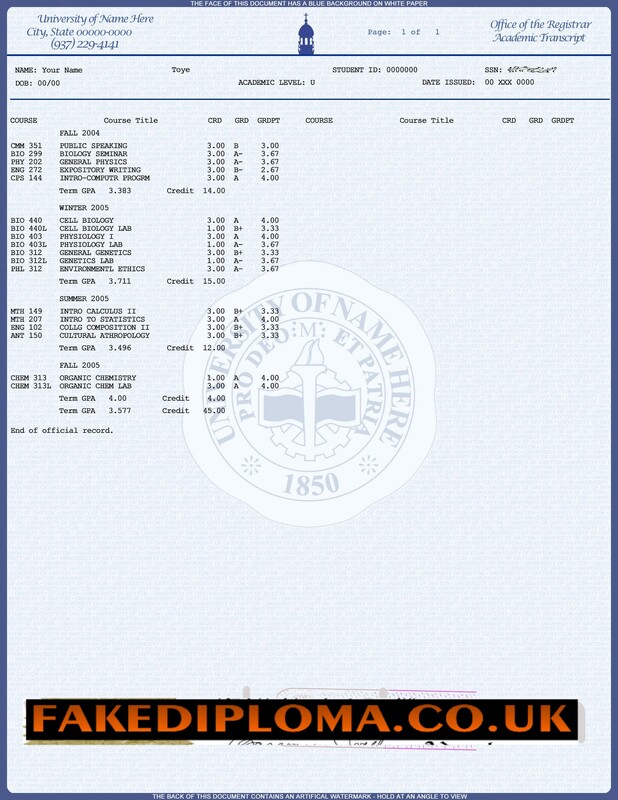 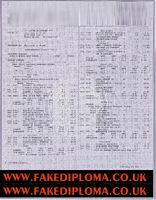 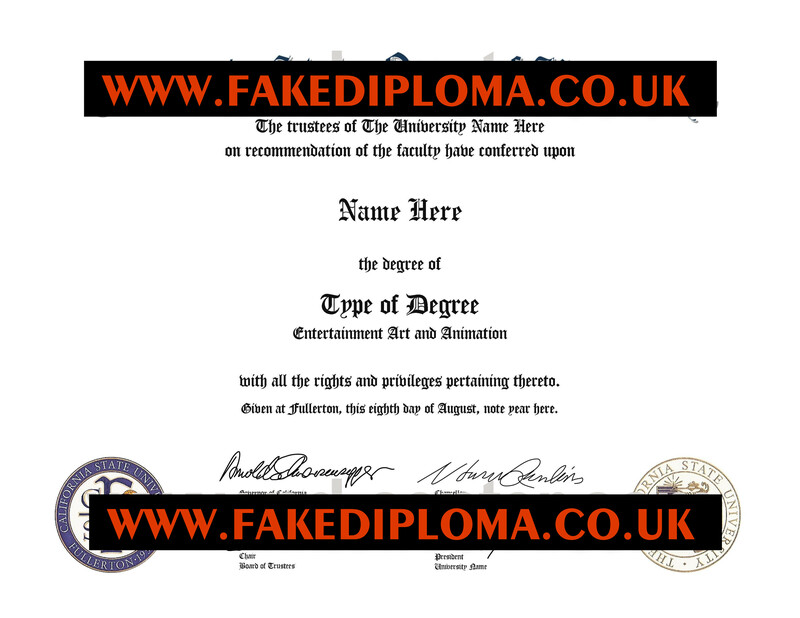 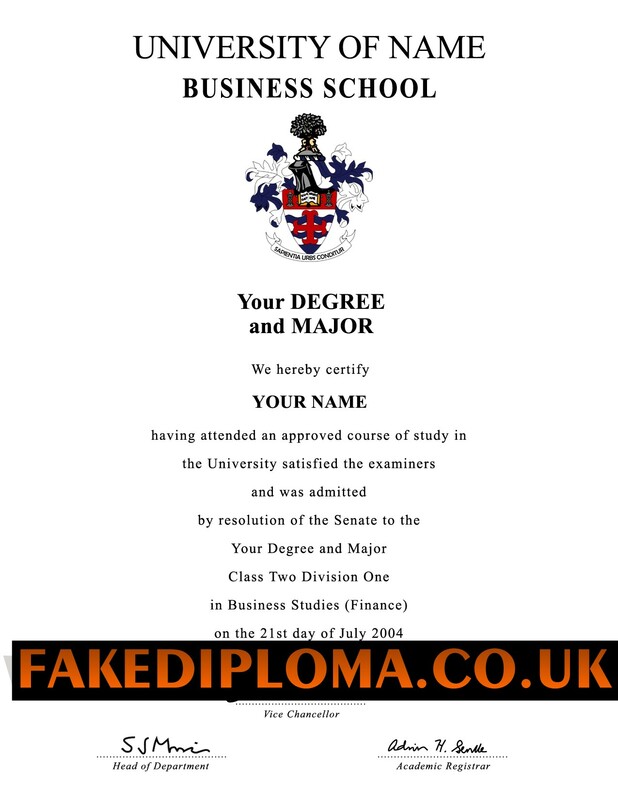 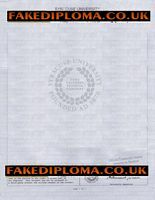 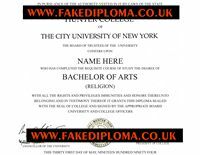 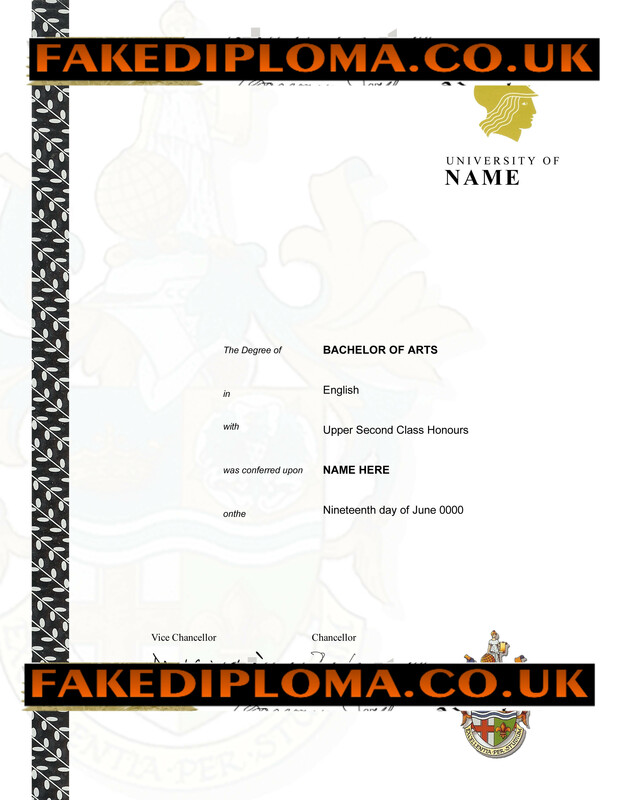 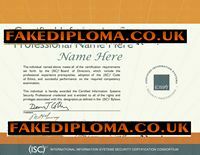 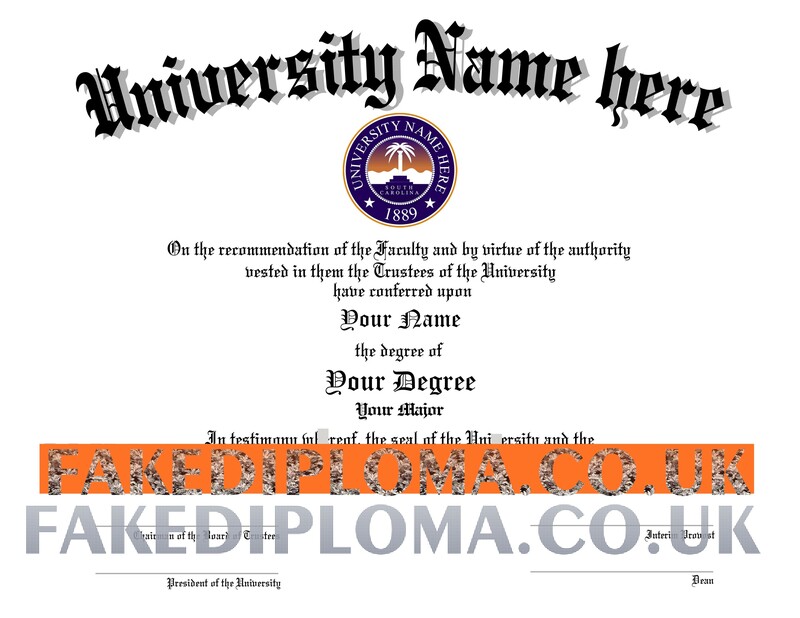 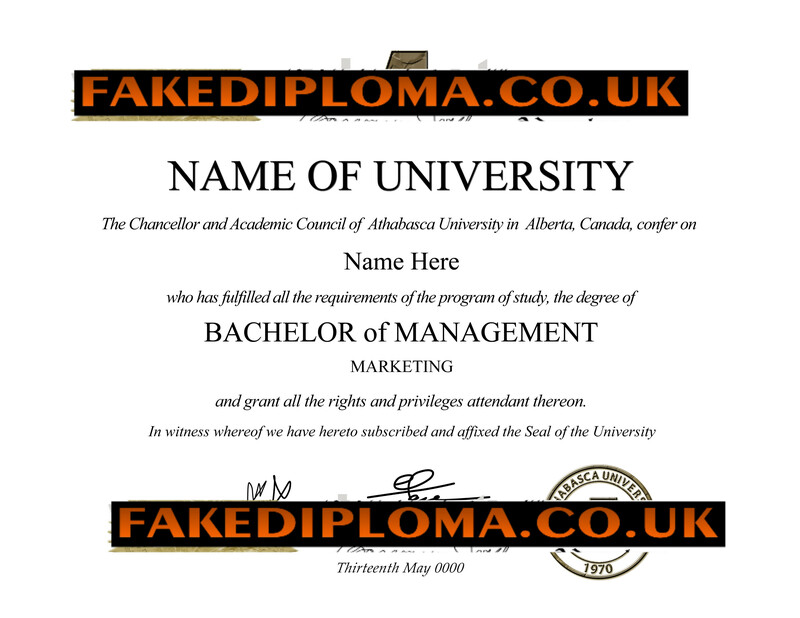 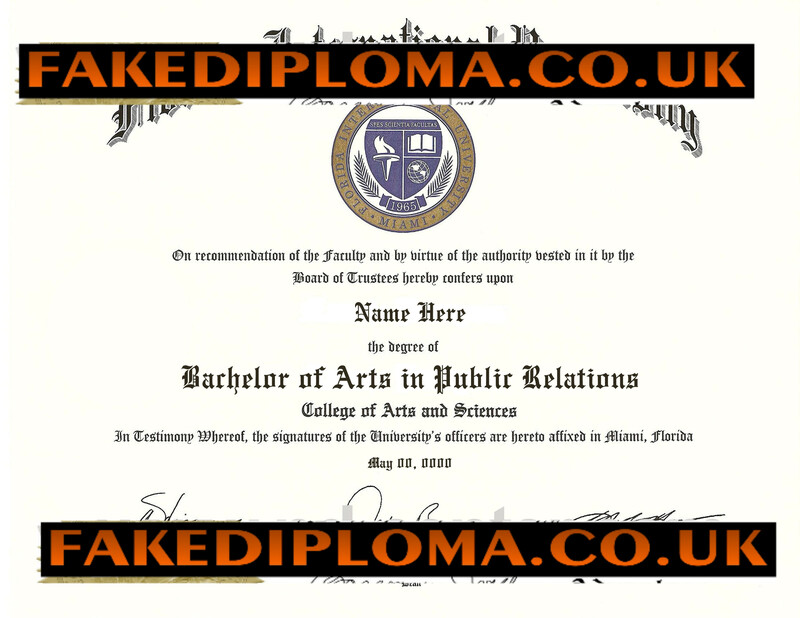 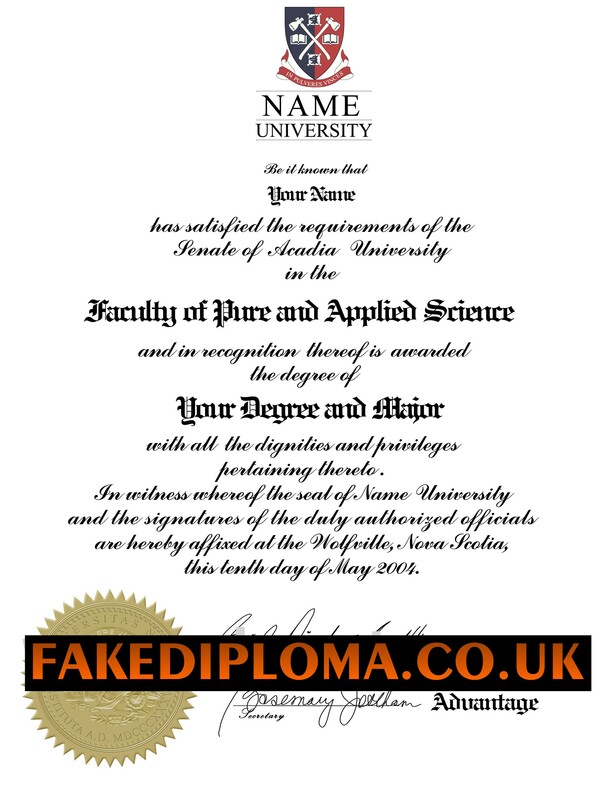 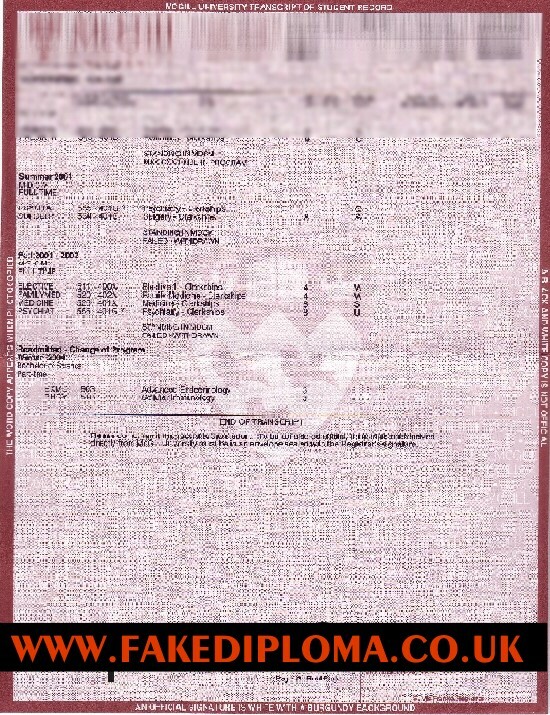 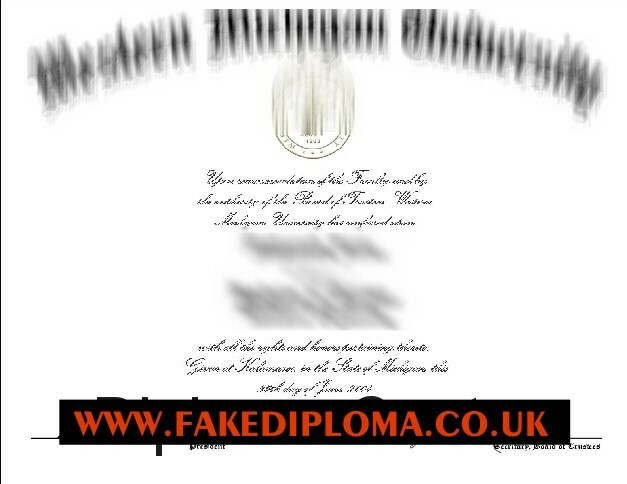 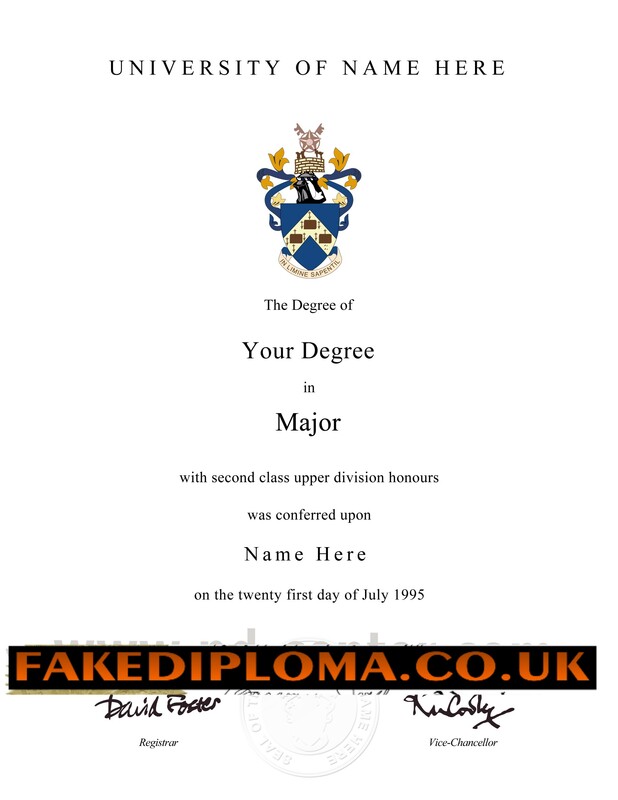 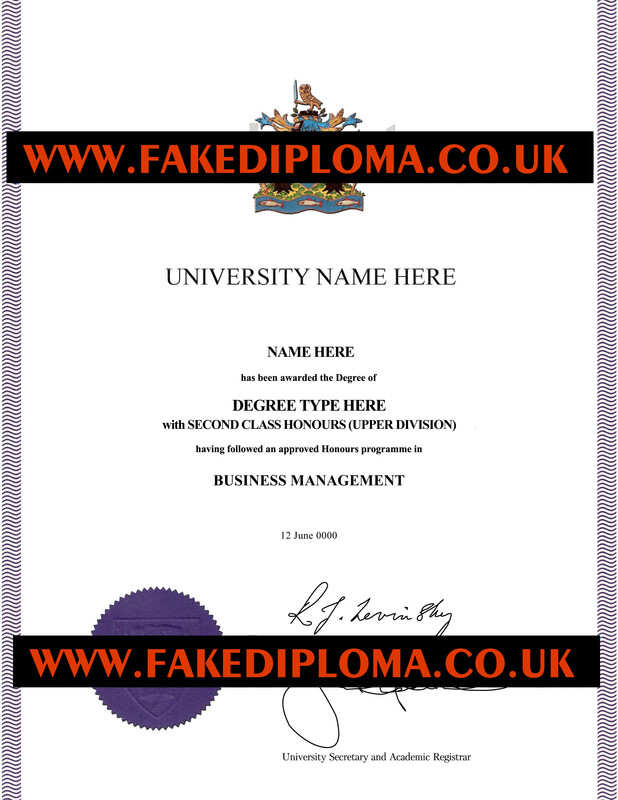 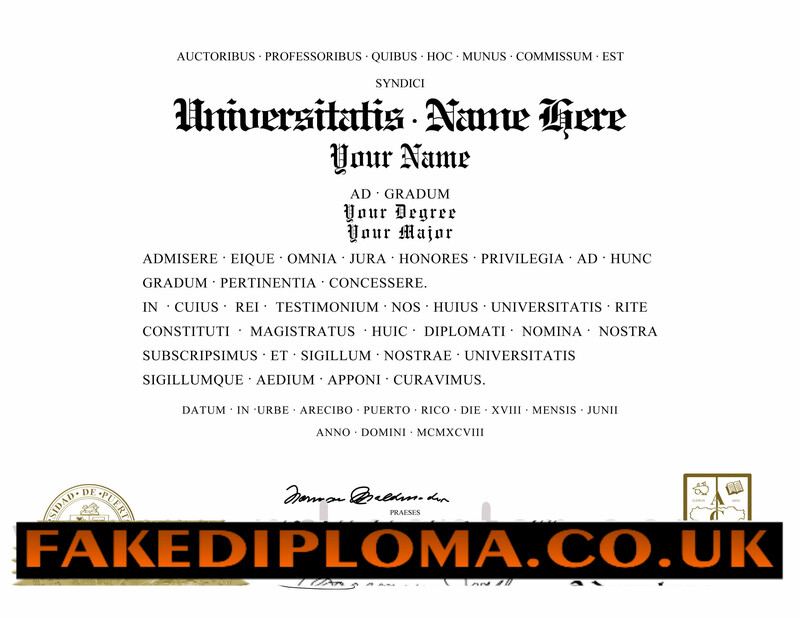 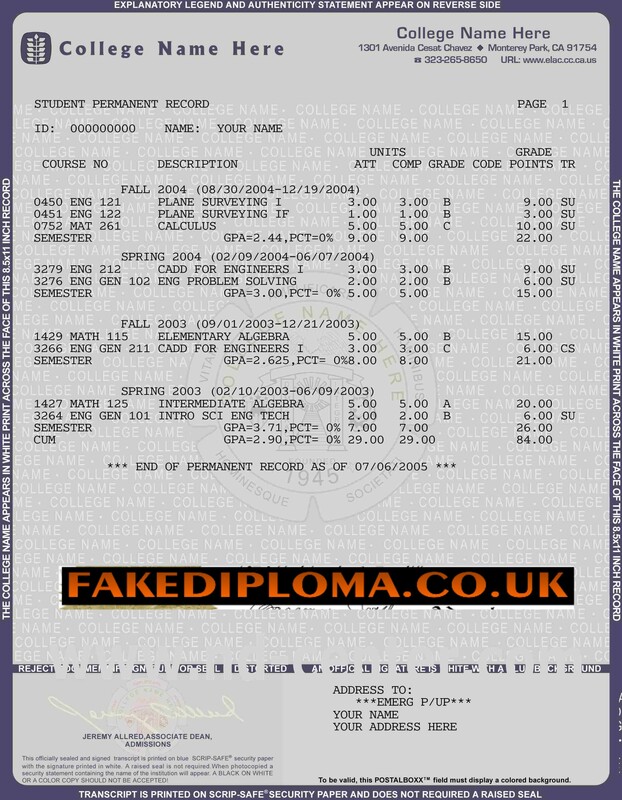 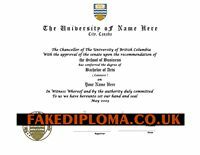 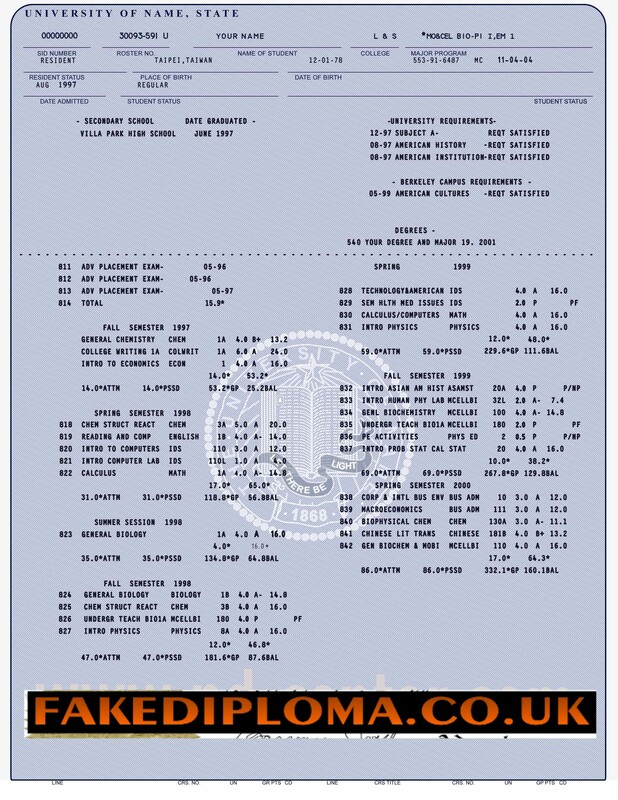 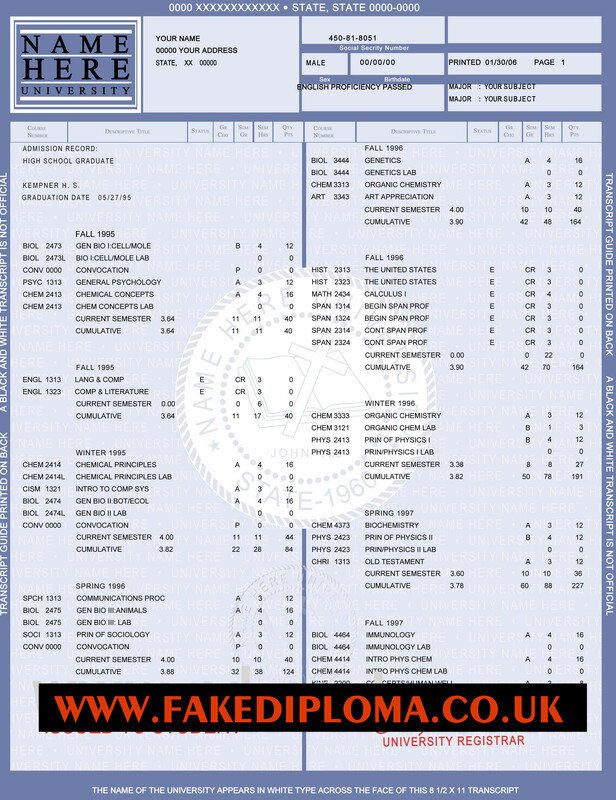 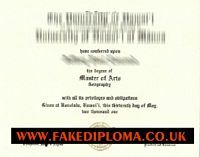 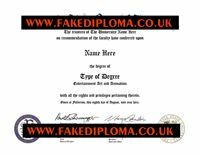 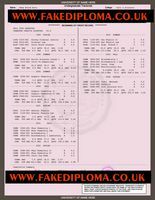 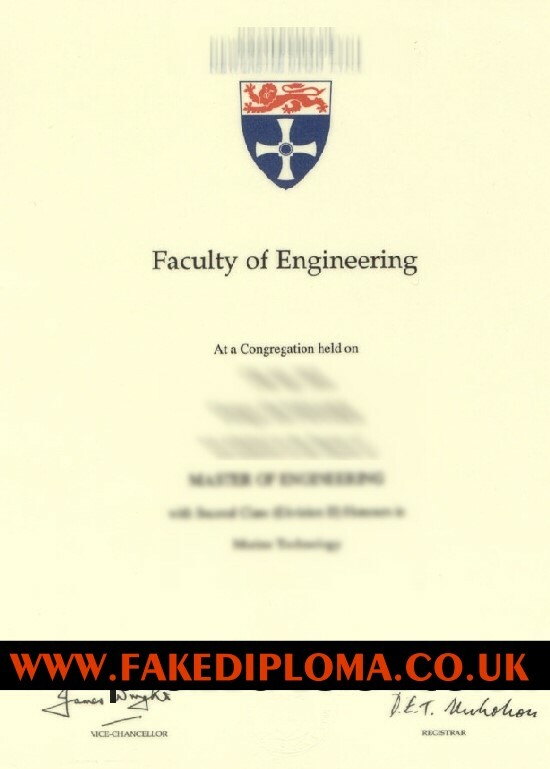 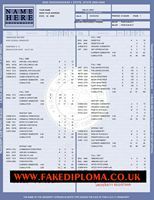 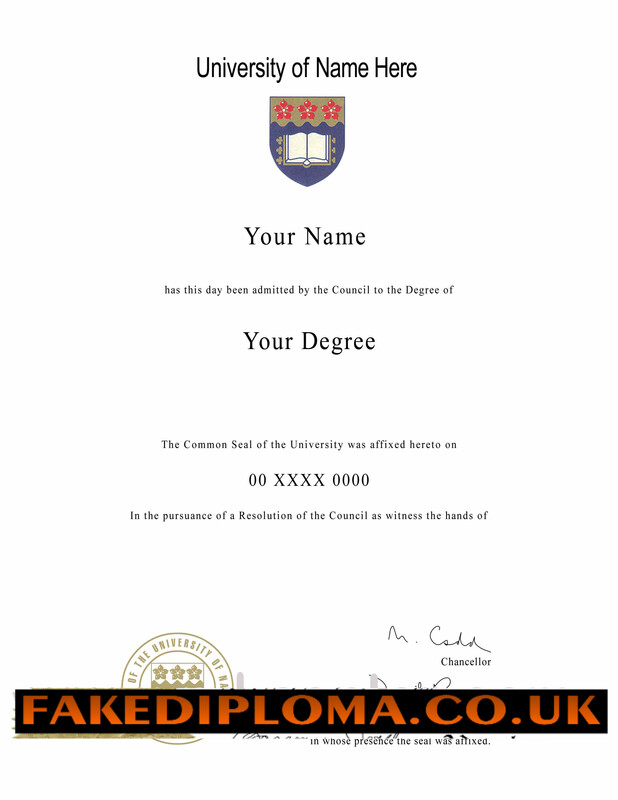 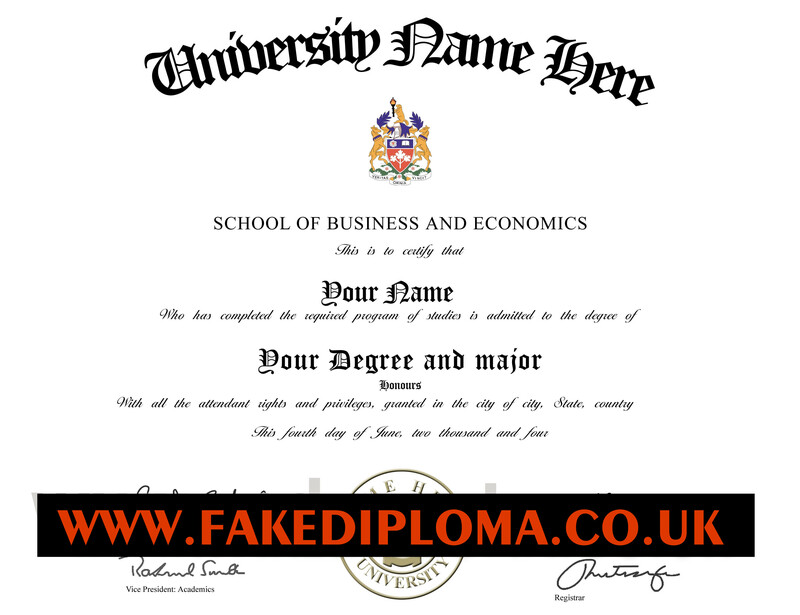 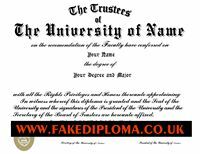 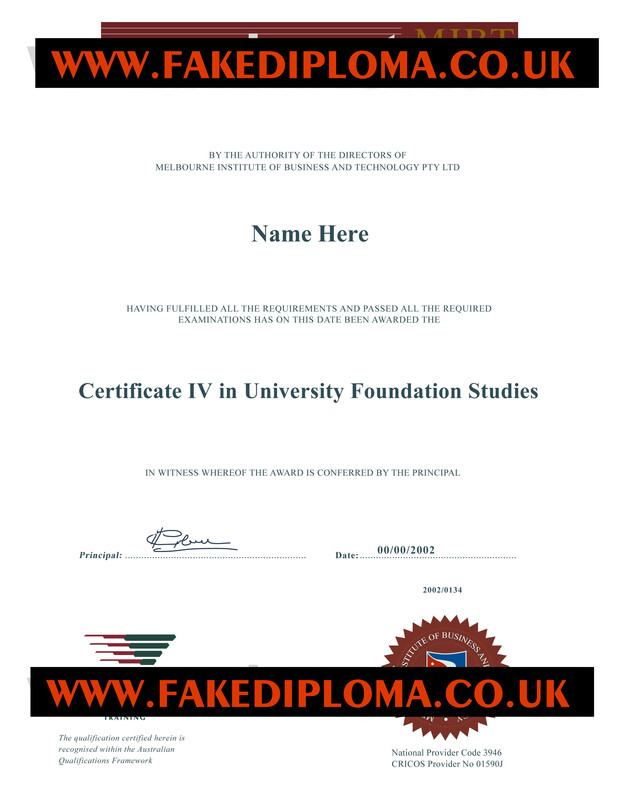 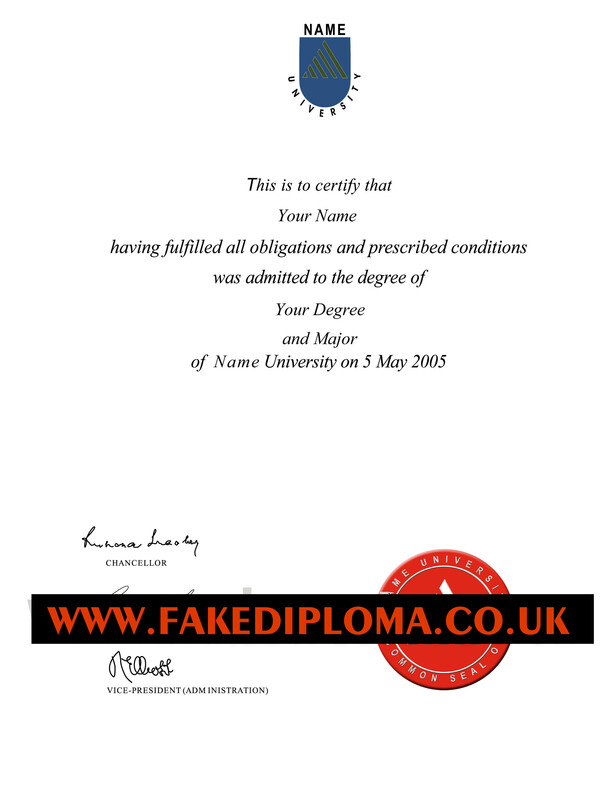 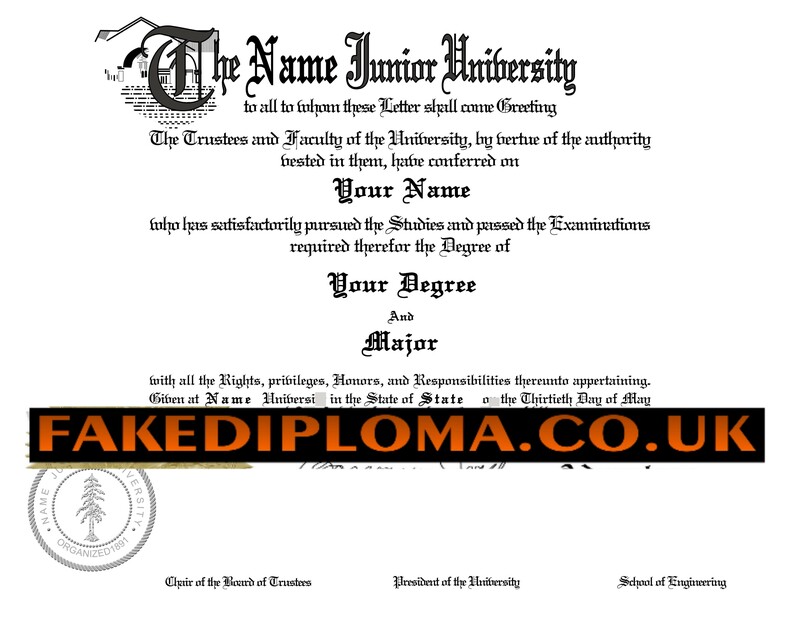 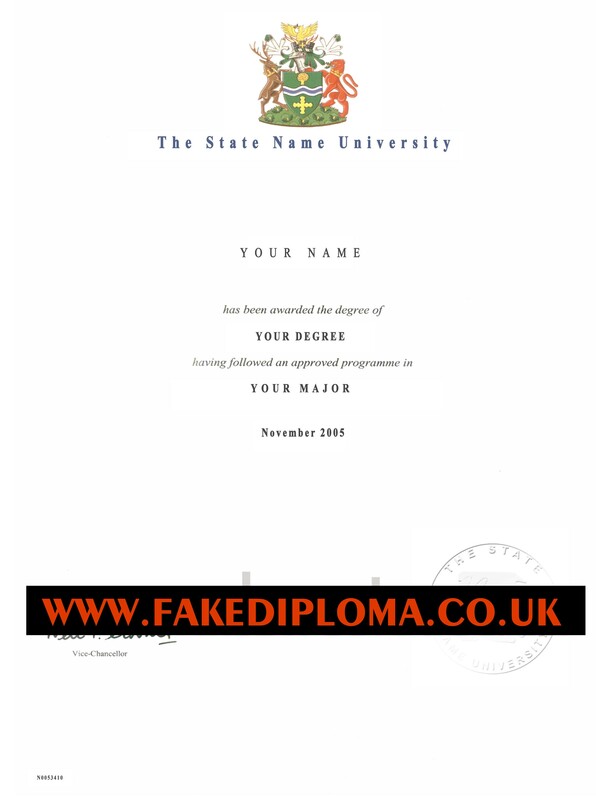 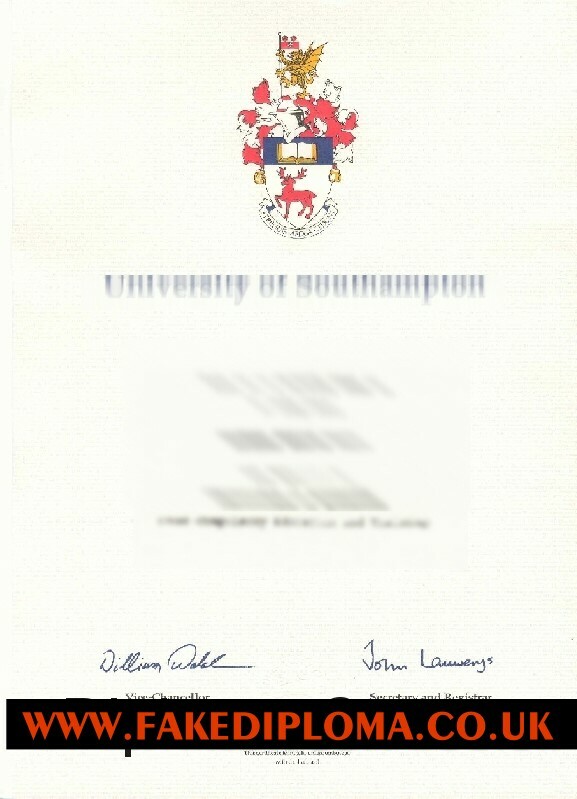 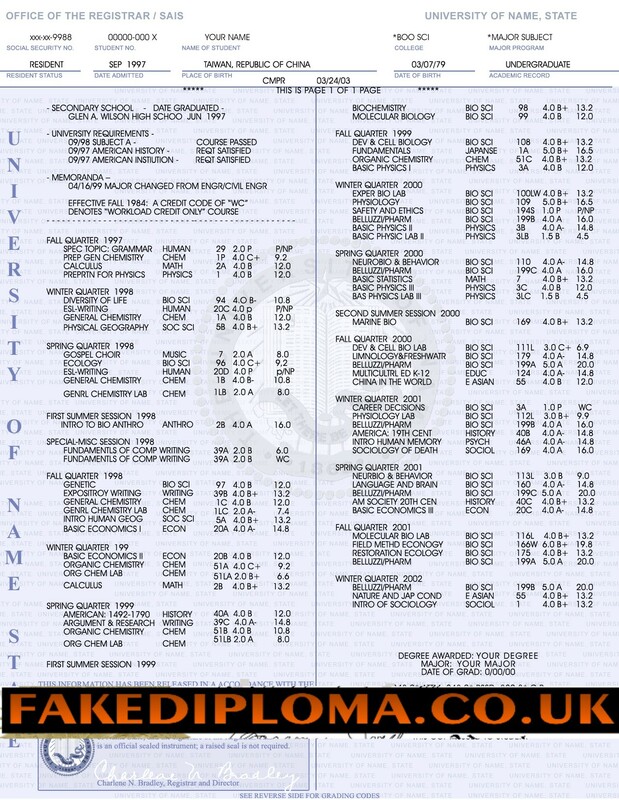 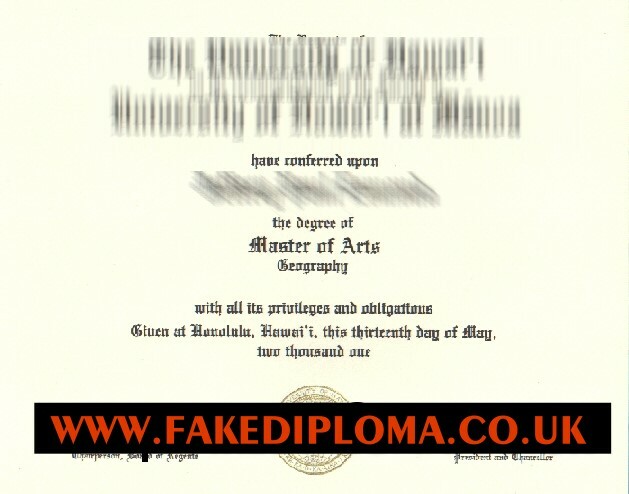 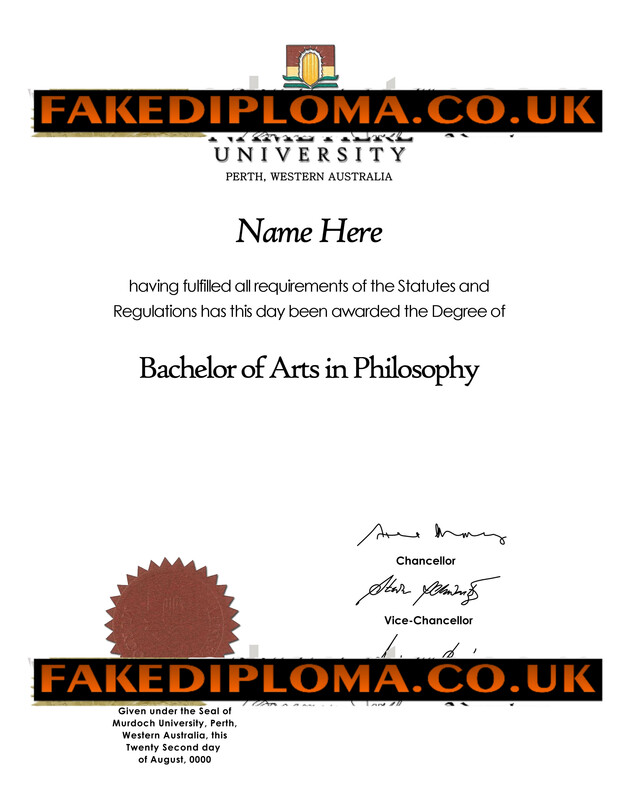 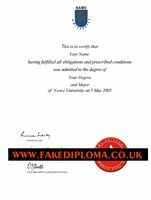 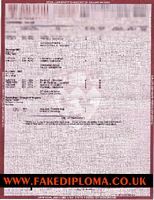 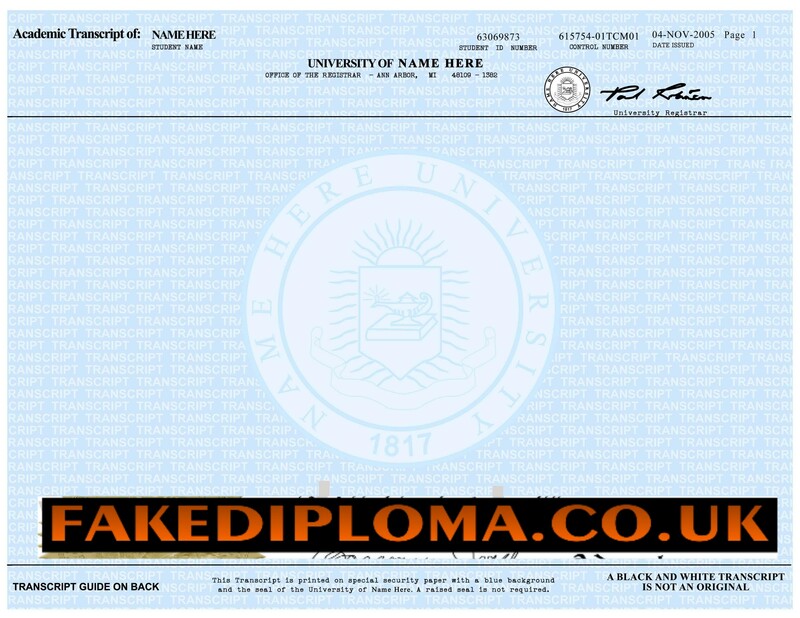 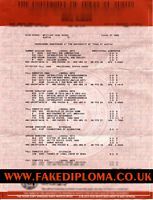 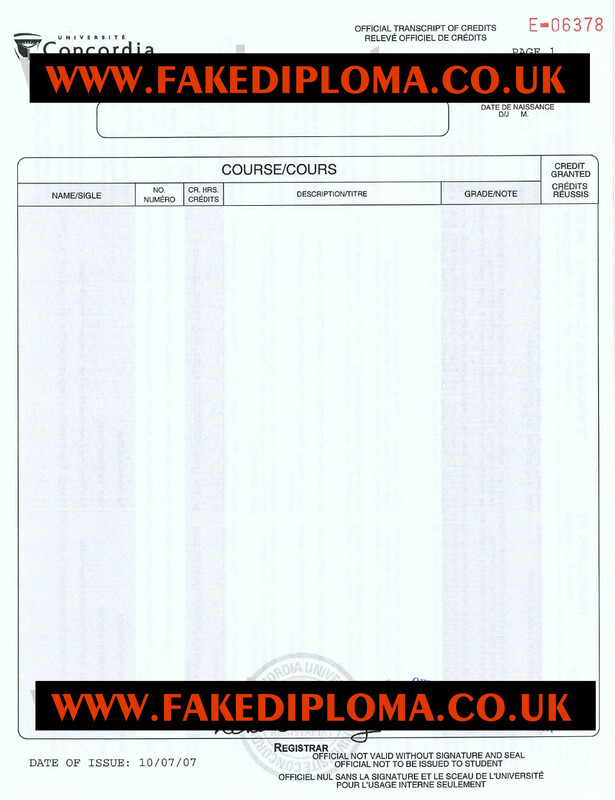 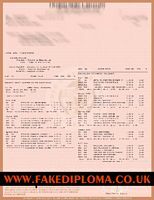 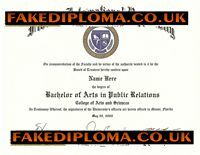 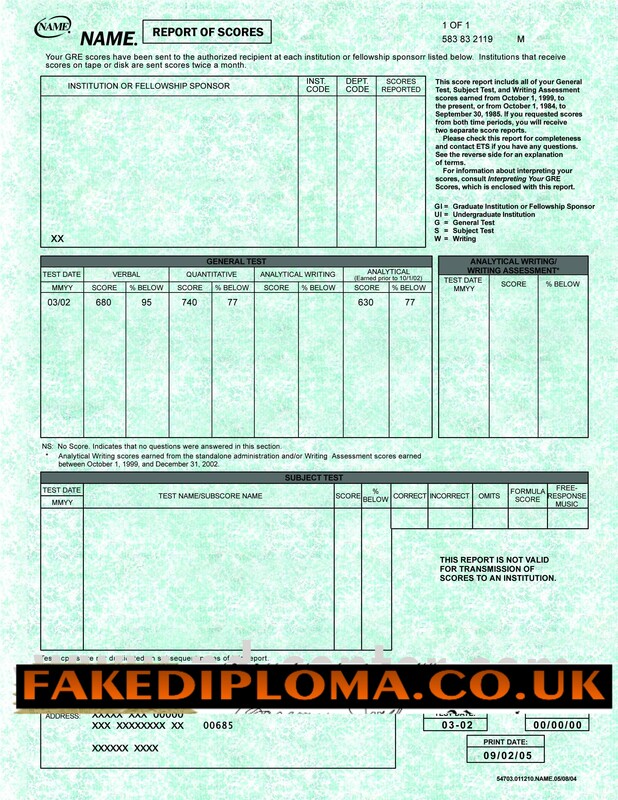 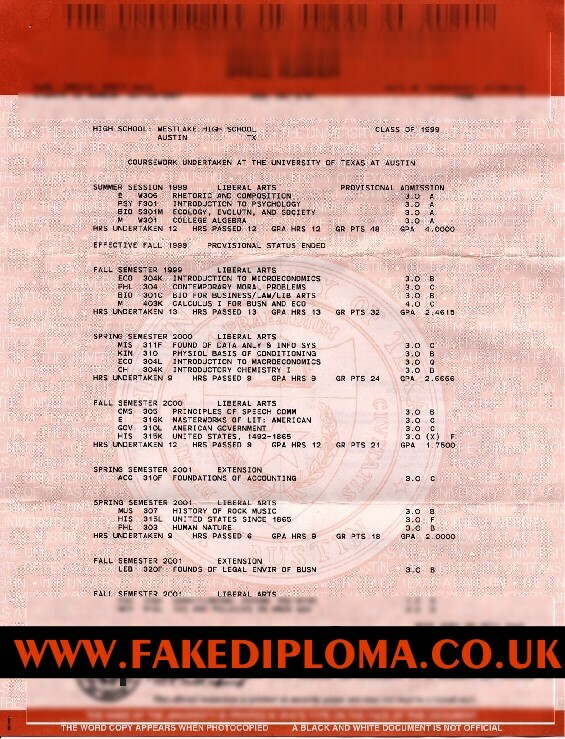 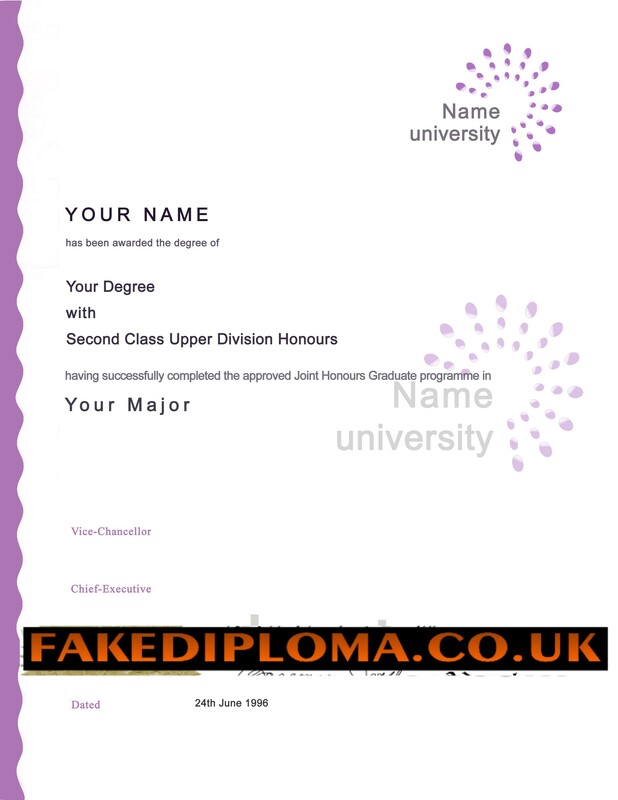 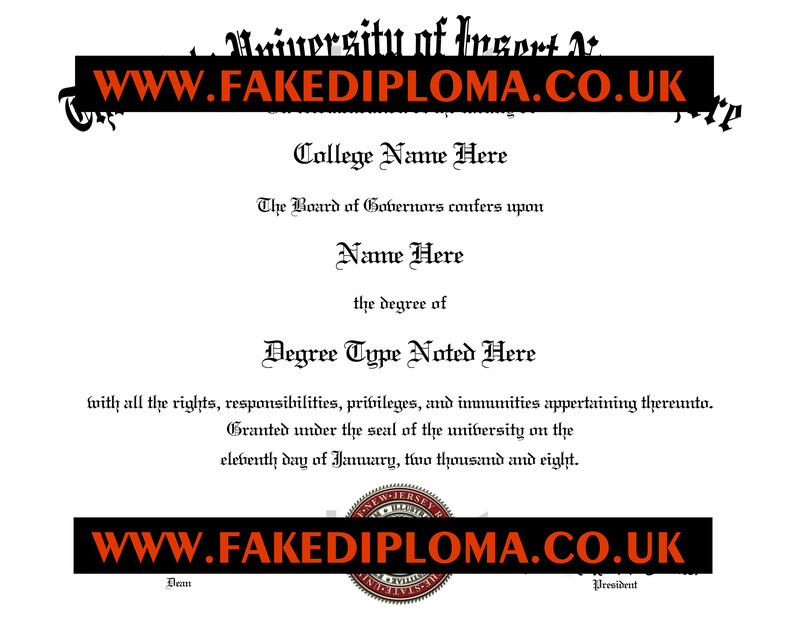 Please keep in mind that the www.fakediploma.co.uk printed on sample images will not appear in the documents created for you, nor will we insert 'novelty' or 'replica' labels be visible on any document you order. 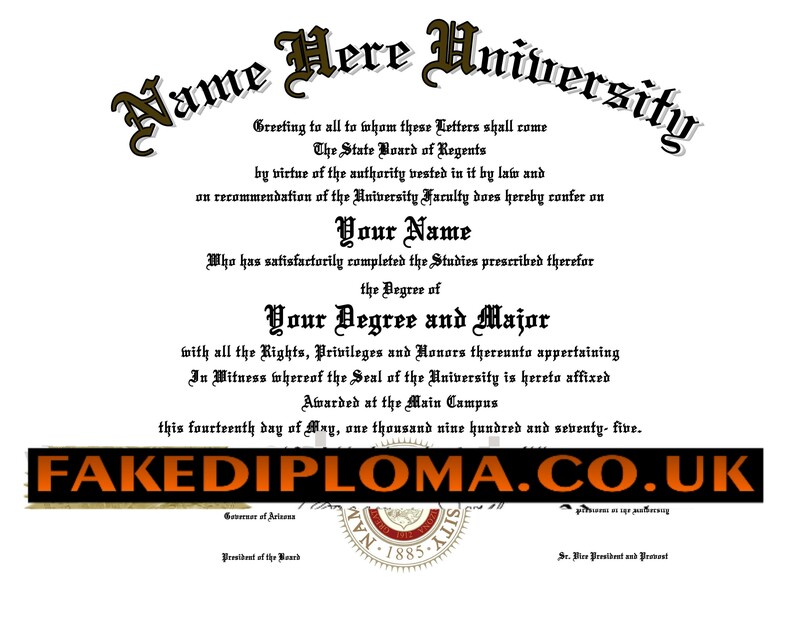 Here is sample portion of our custom designed novelty diplomas and transcripts. 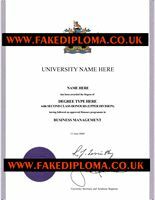 In particular for these sample images please note that we respect copyrights of all Colleges and Universities, and we cannot display actual designs to infringe on copyrights of others, therefore each sample design is shown in generic format. 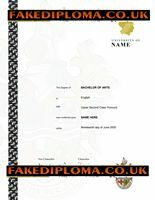 The actual custom design for your documents is of very high quality to meet your needs and are created to your exact specifications. 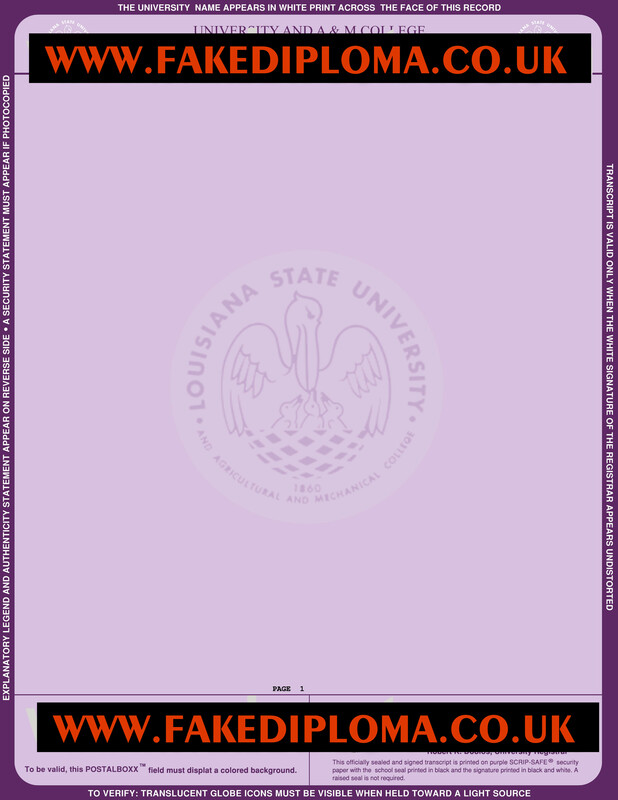 To view a higher resolution representation of the same image, simply click on the image. 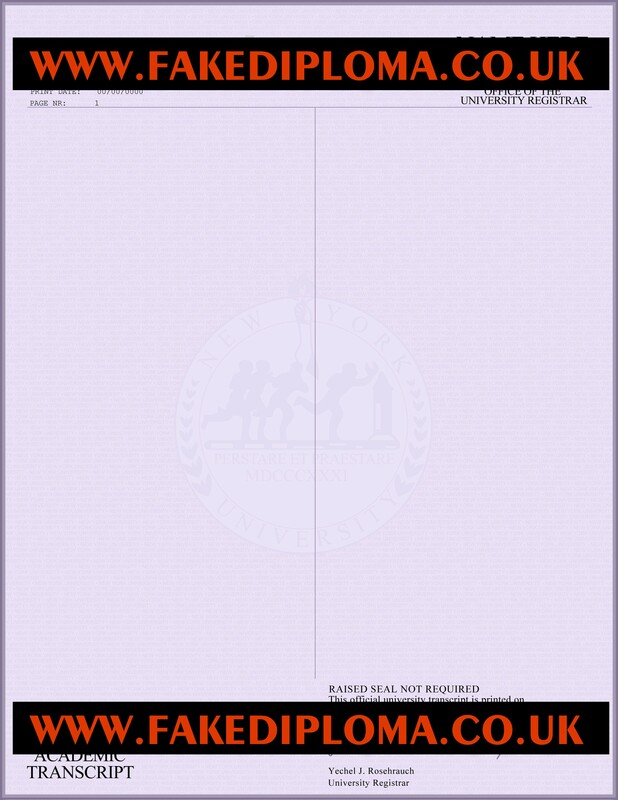 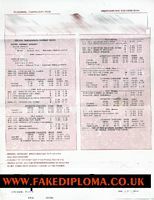 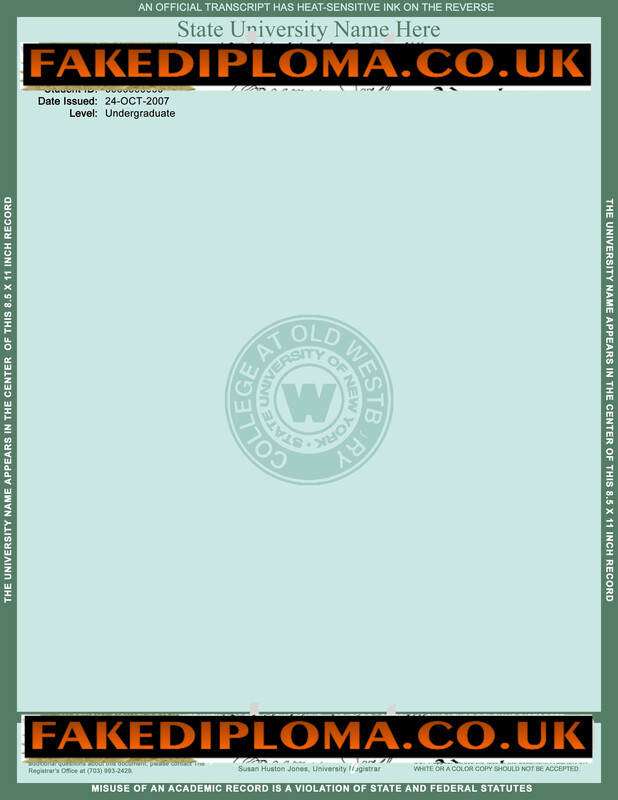 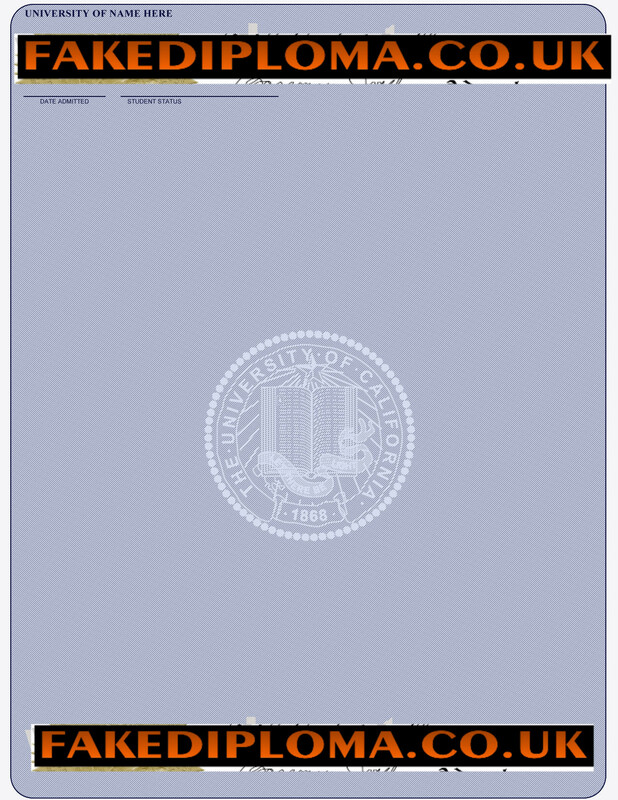 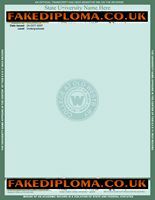 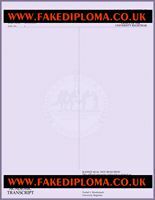 The highest quality parchment and security paper are available in several colors and your custom document will be matched closest to the original design, however some samples are only shown on clear with paper for viewing. 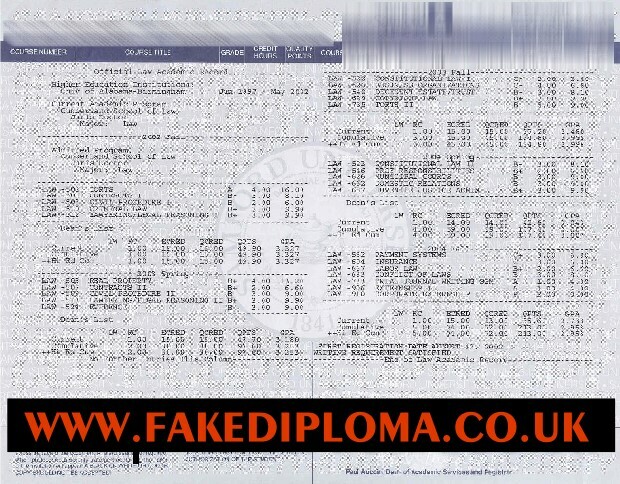 We are confident that the samples shown here are very impressive. 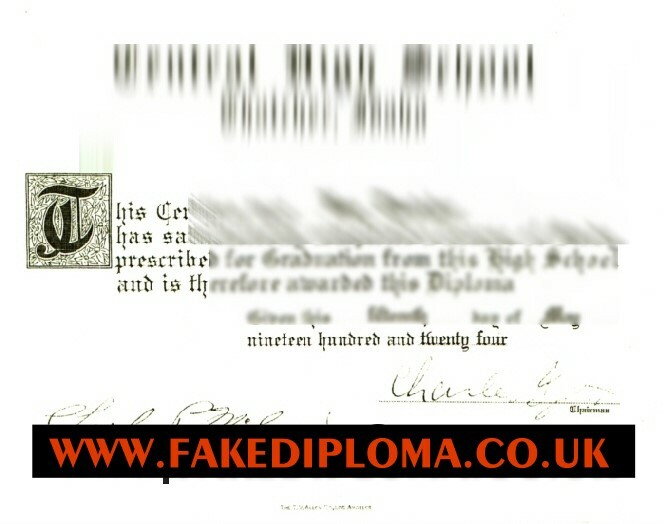 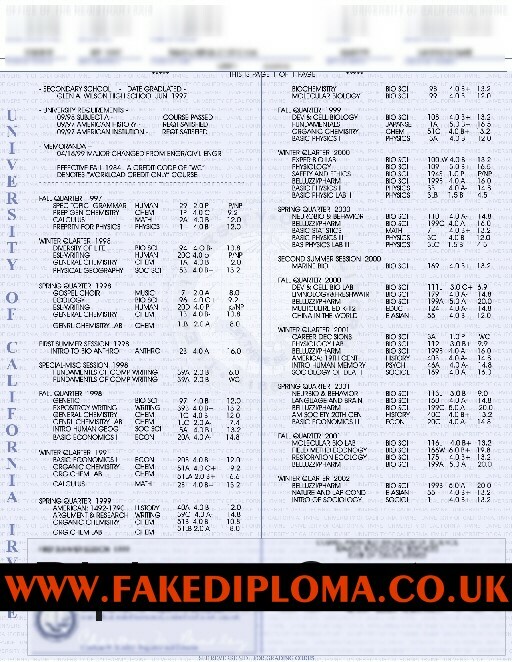 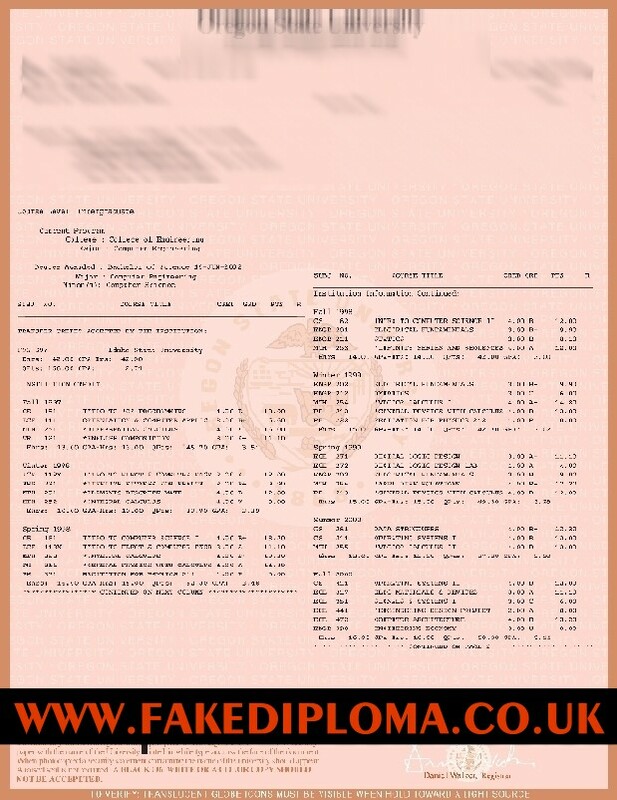 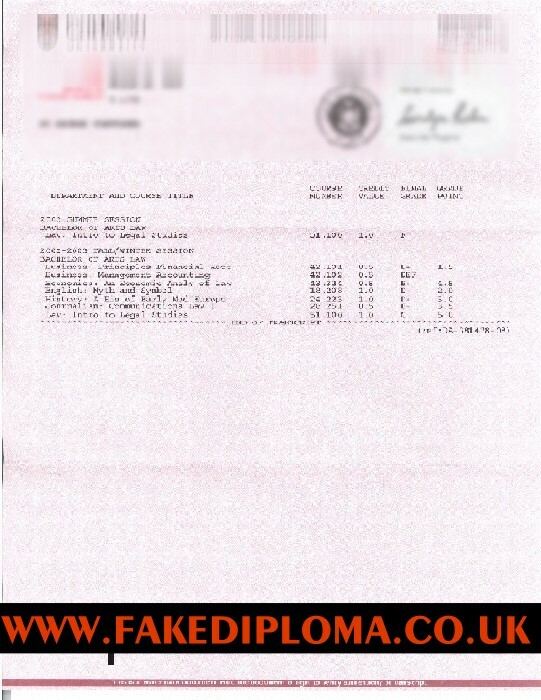 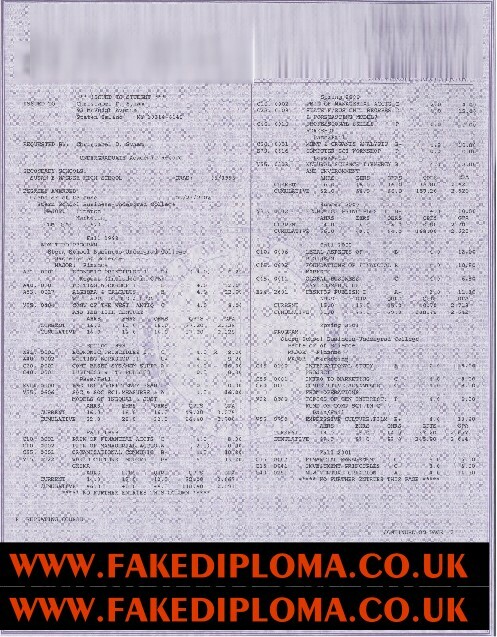 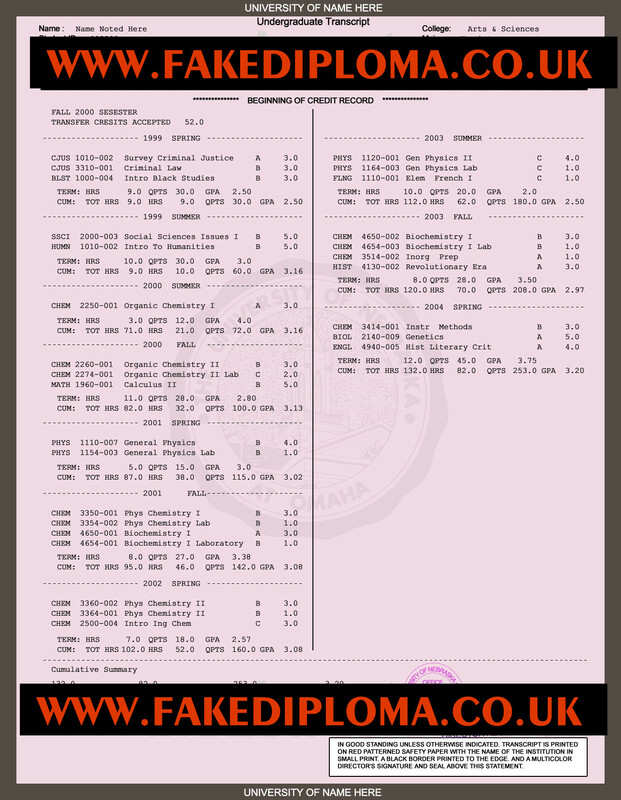 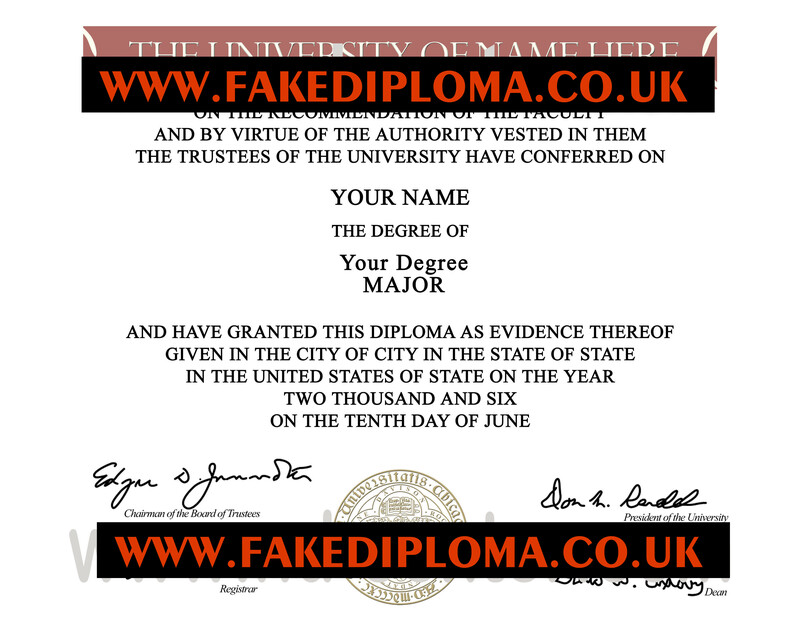 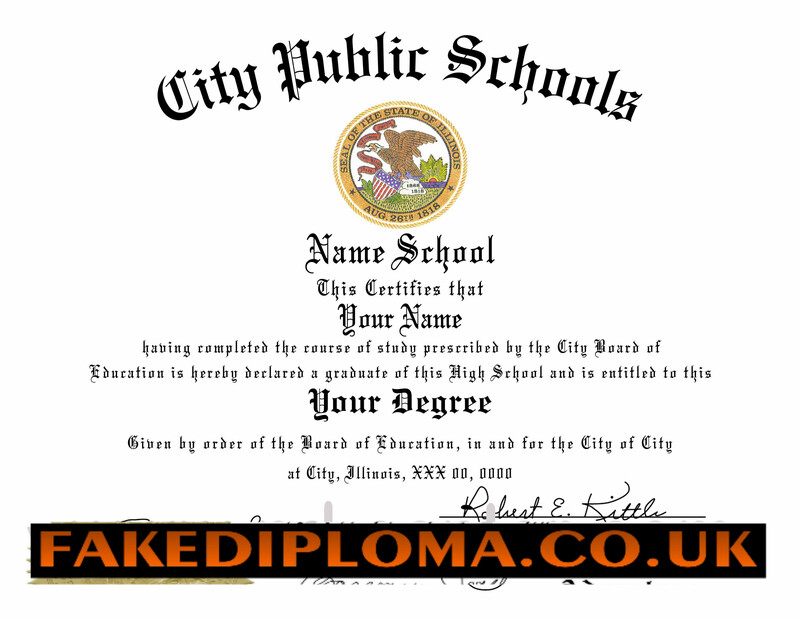 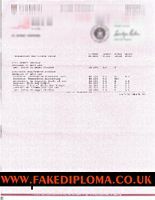 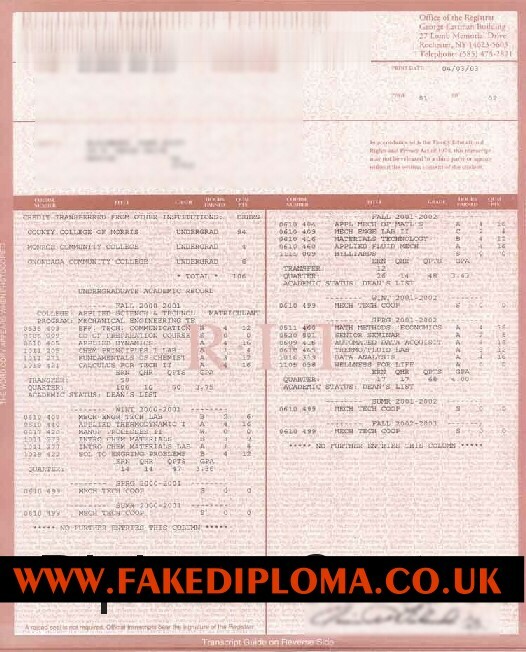 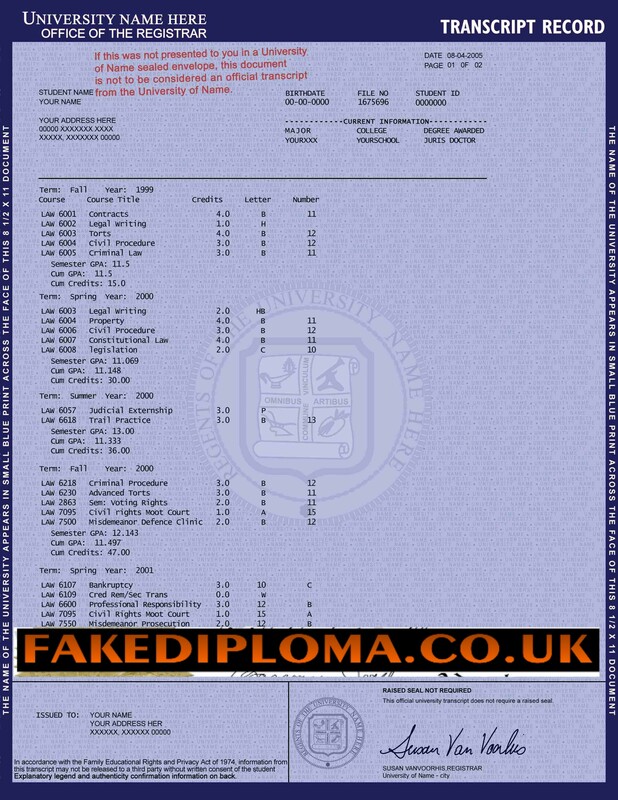 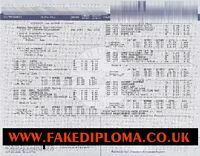 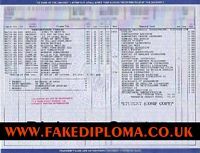 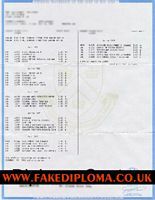 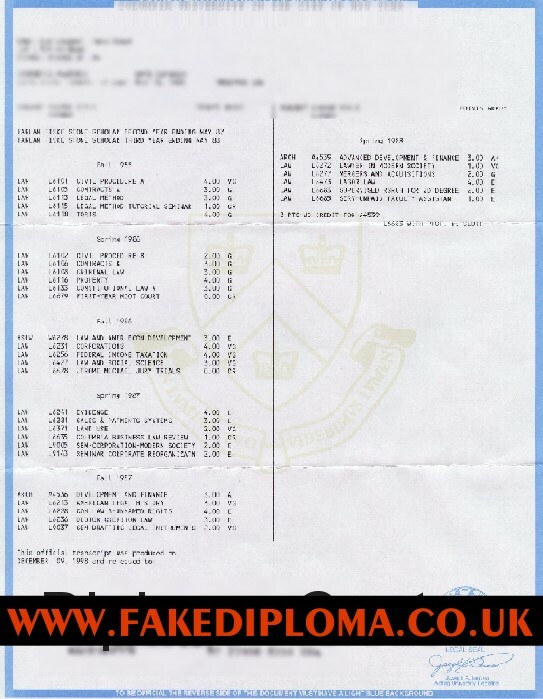 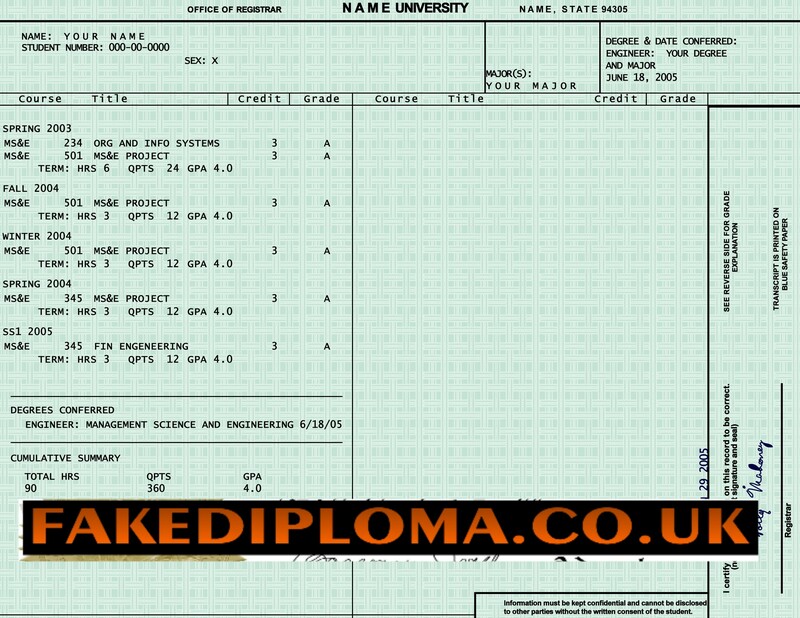 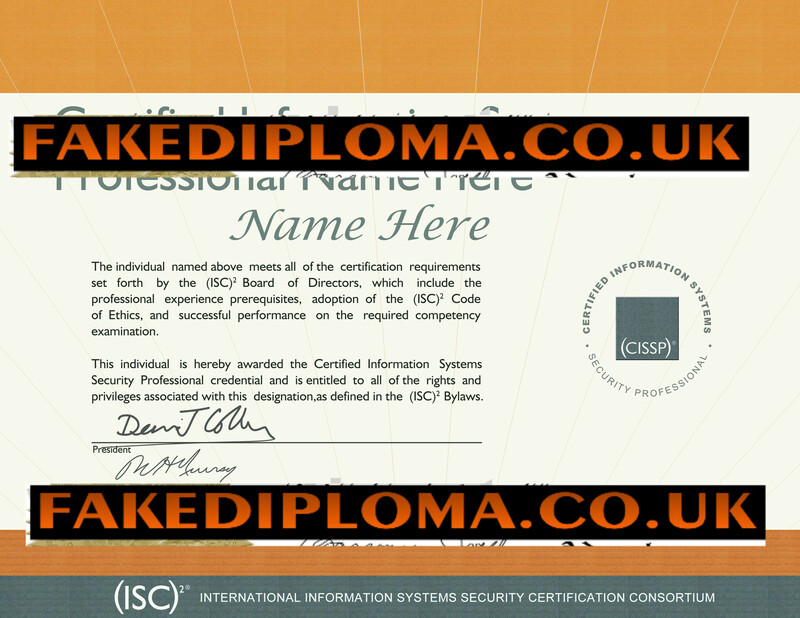 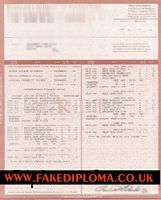 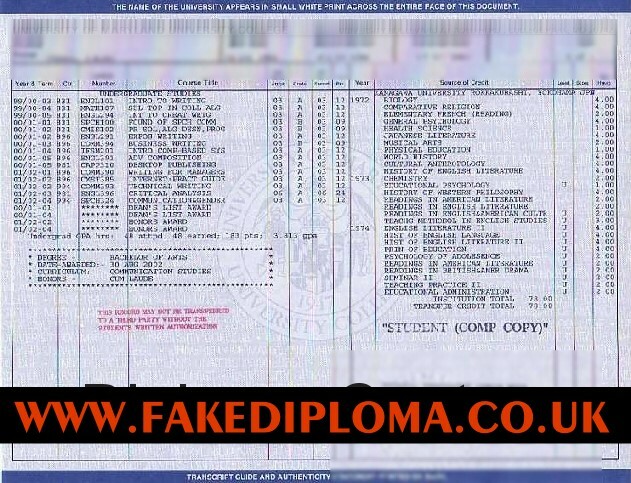 All samples shown on this page have fakediploma.co.uk across them for security reasons. 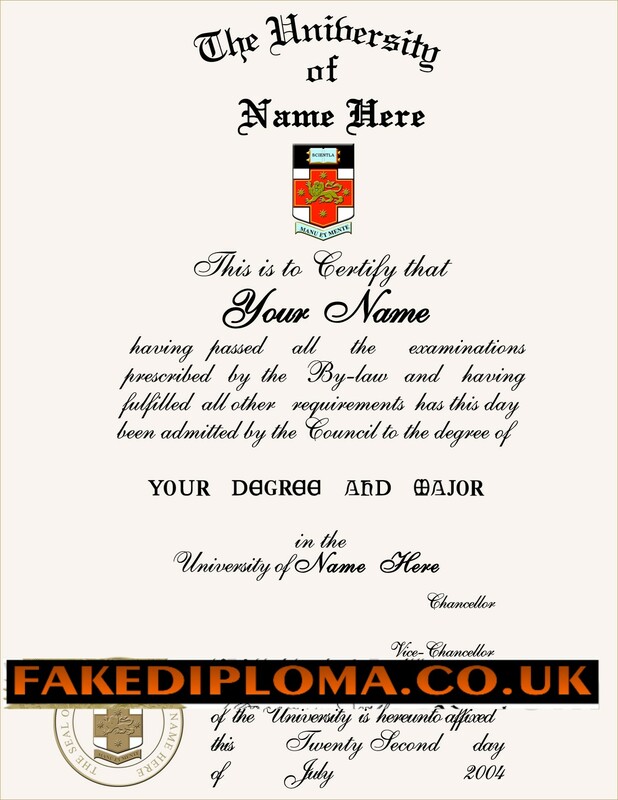 Your order will not have our name printed across any document. 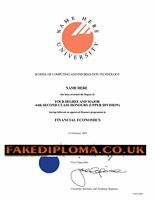 Why you should get our products? 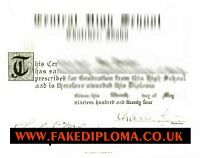 Any fake certificate you create or give as a gag gift, is a fantastic memento by opting for the right frame to enhance the look of your new product. 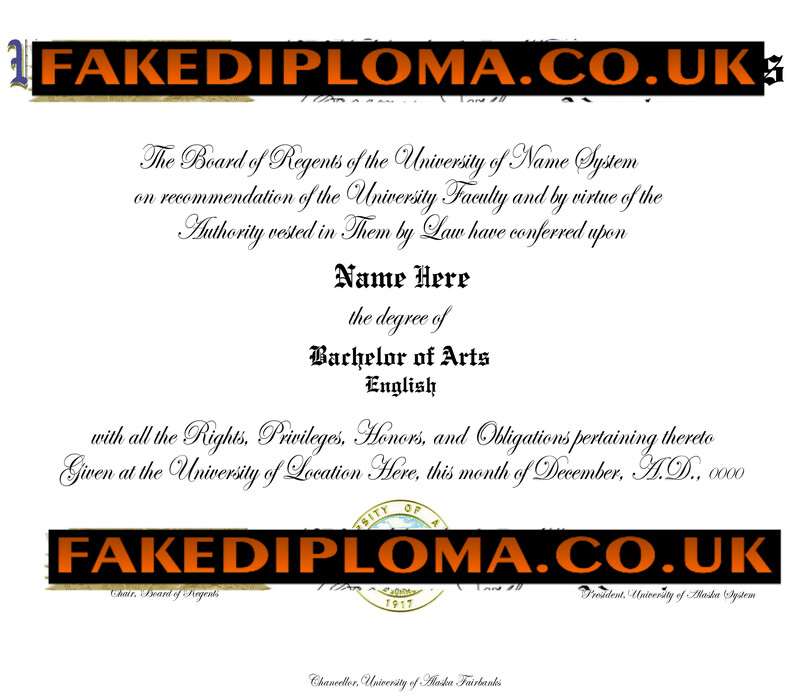 In previous years, frames for such an item lacked creativity and could be purchased in only one or two designs. 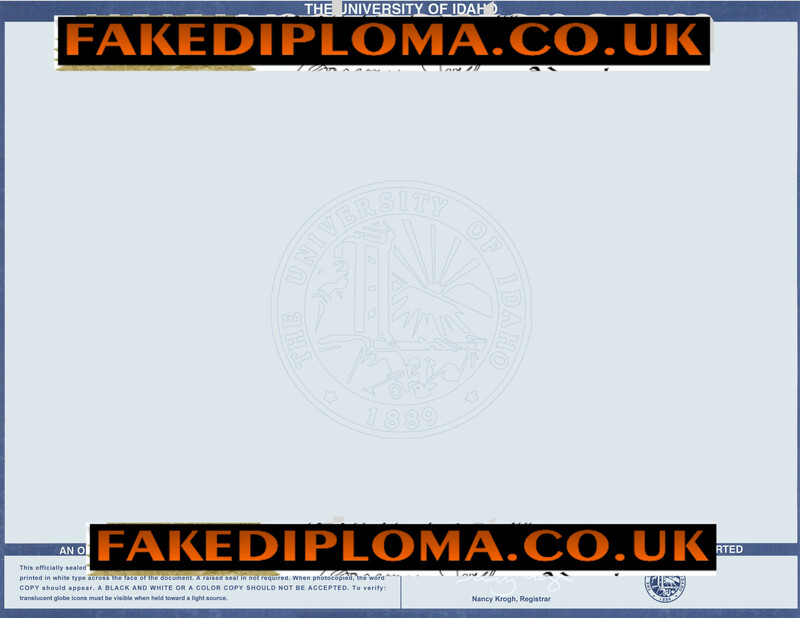 Now there are quite a large number of frames to choose from. 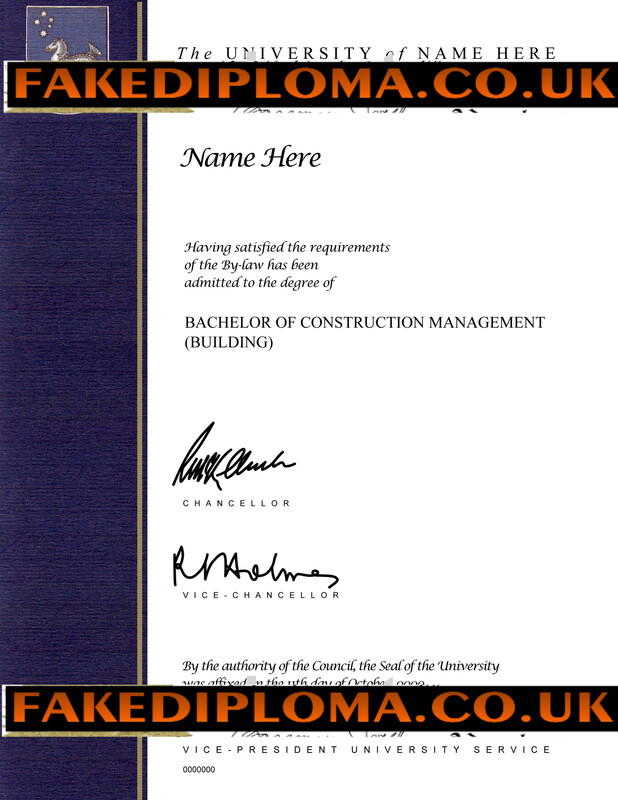 The most classic frame that can be purchased for your fake degree certificate include is a brown wooden frame. 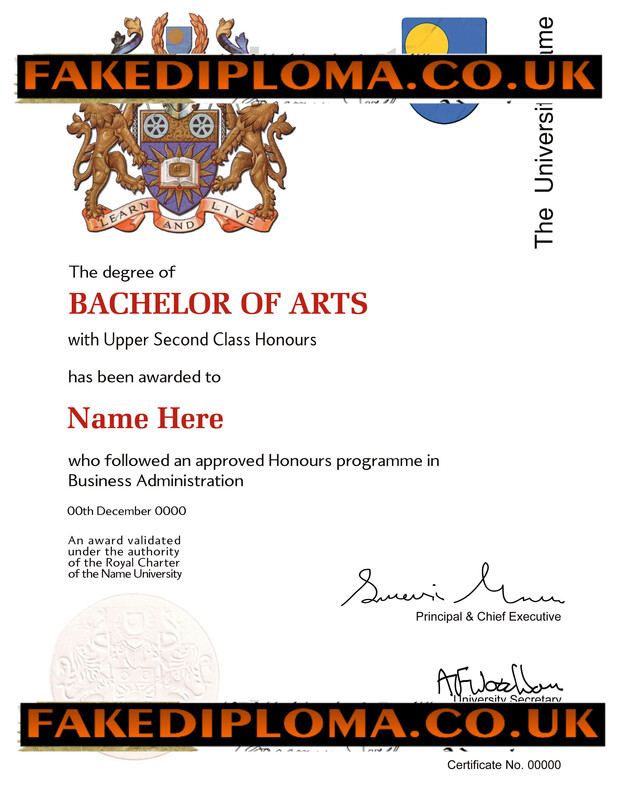 These types of frame are commonly used for authentic looking documents. 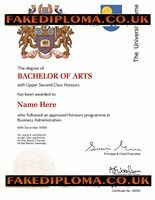 A style of wooden frame that is better suited to complement antique furniture in your house would be cherry mahogany frame. 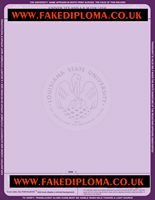 A cherry mahogany frame can definitely enhance the look of your item. 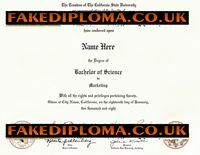 A third option in purchasing a frame is metal. 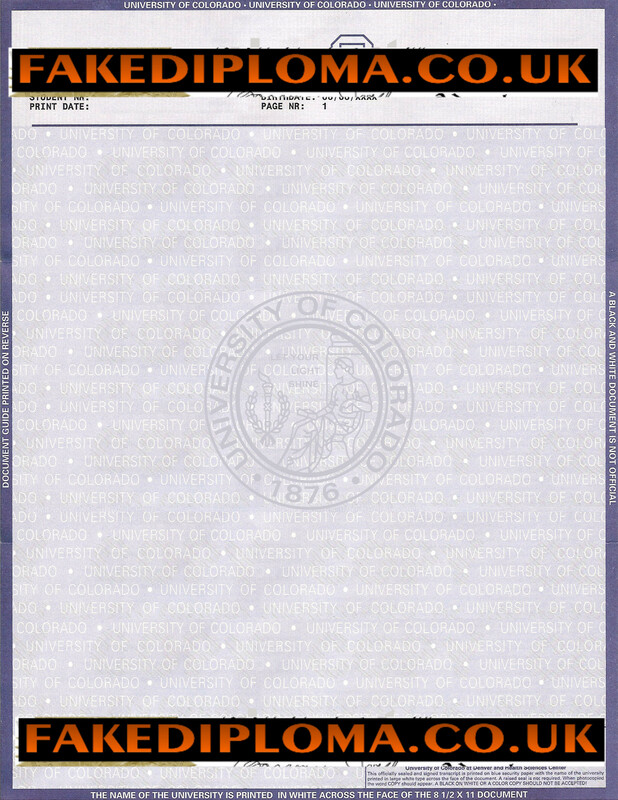 Though heavier than wood, there are a variety of metal frames available. 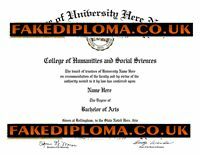 Examples of metal frames to enhance it includes a bronze frame with a patina finish, a brass frame, and a silver or gold frame. 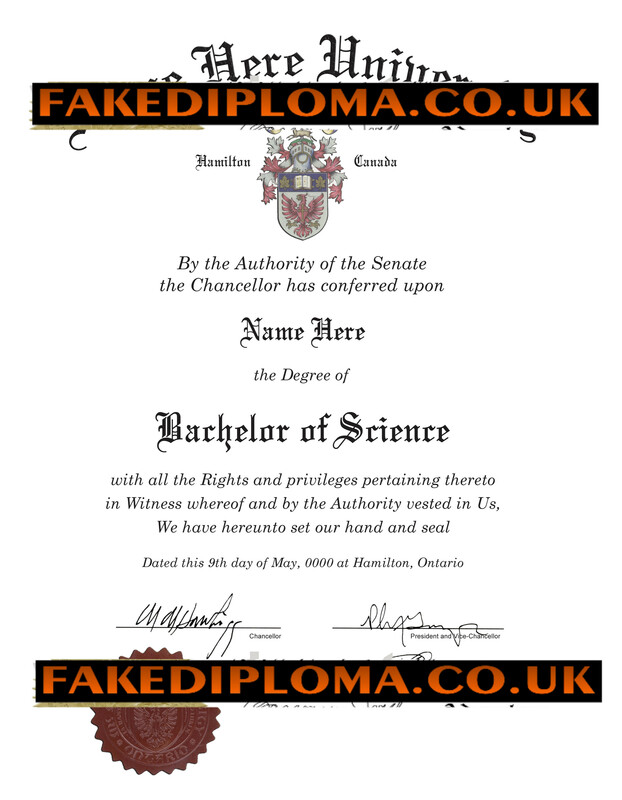 Standard information on a fake college degree usually includes the name of the graduate, type of degree, course of study, a graduation date, and what is most important, the official signature. 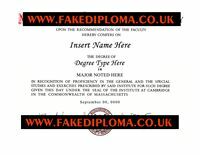 We provide the most up to date advanced technologies for reproducing actual signatures that can create precise and authentic looking novelty diplomas and certificates, all with the option of an embedded seal to complete your original fake college degree, diploma or transcripts. 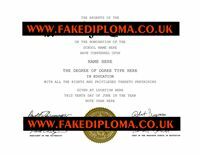 Our customers have been amazed at the quality and design of our products. 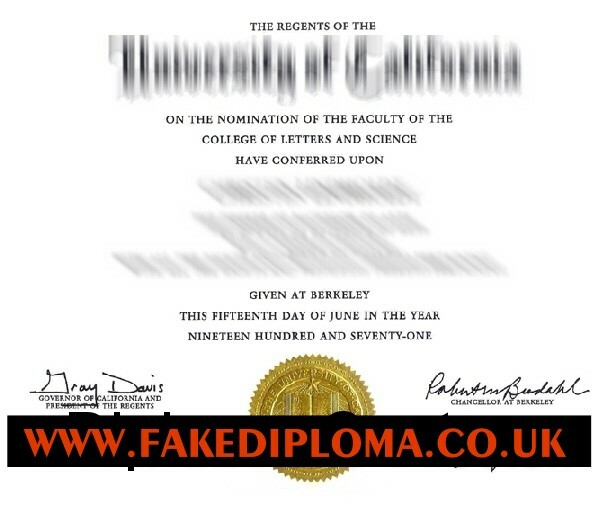 It is not just a fake certificate, fake degree or fake diploma, but a piece of original art! 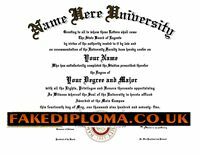 You can choose from more than a dozen college majors to create your custom novelty diploma. 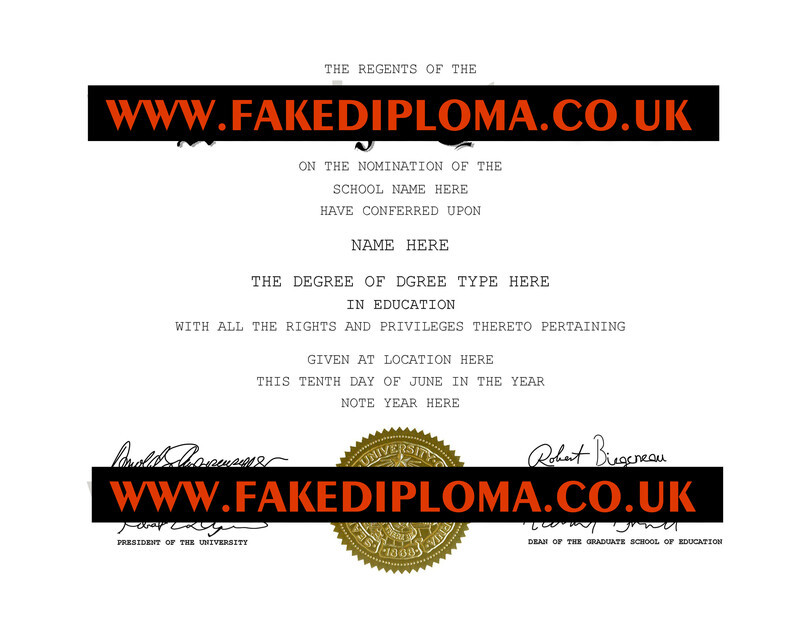 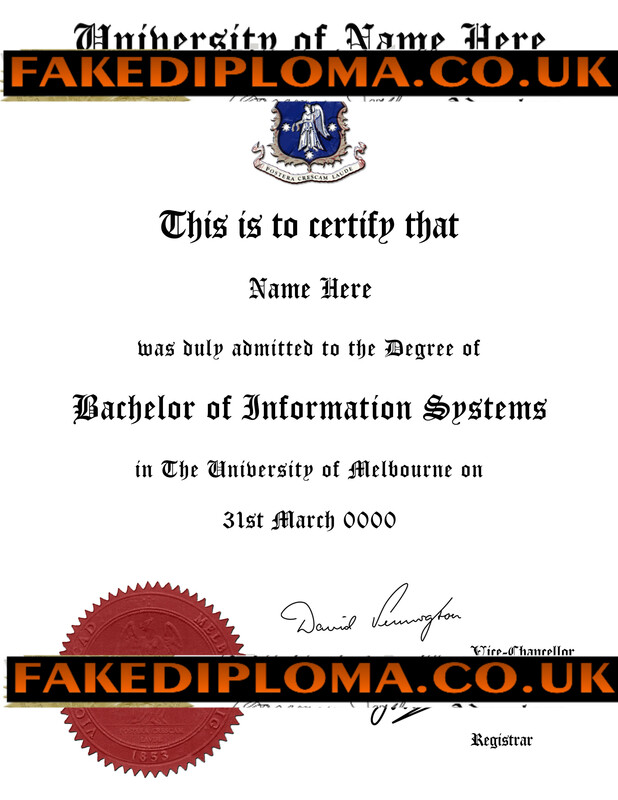 Fake diplomas or fake degrees can be used as great novelty items to play a practical joke on your friends. 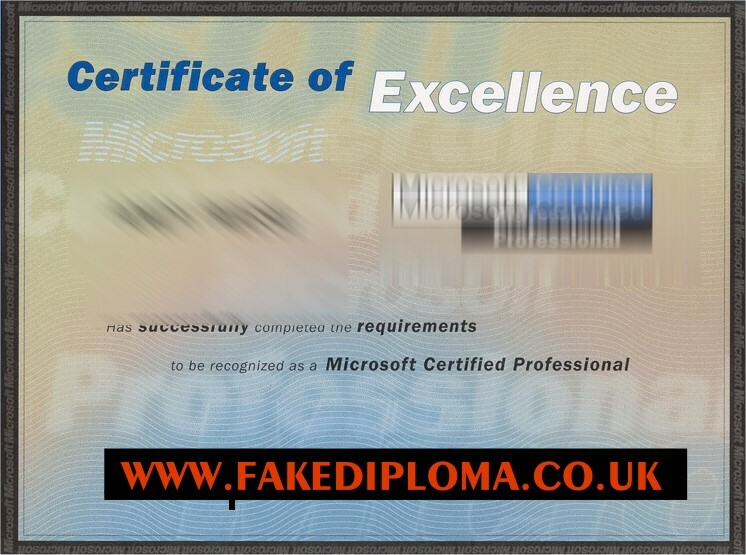 The latest news about our products can be found in our fake diploma blog, updated weekly. 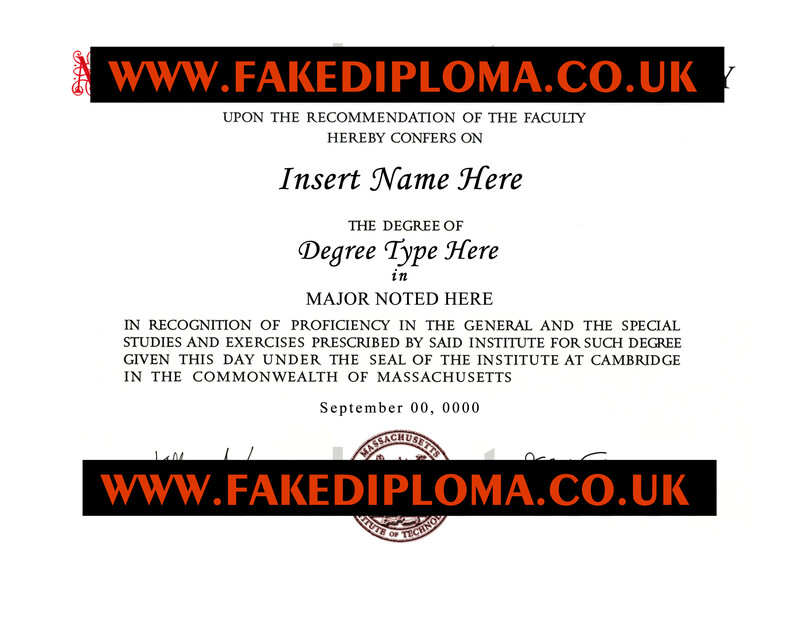 phony diplomas.